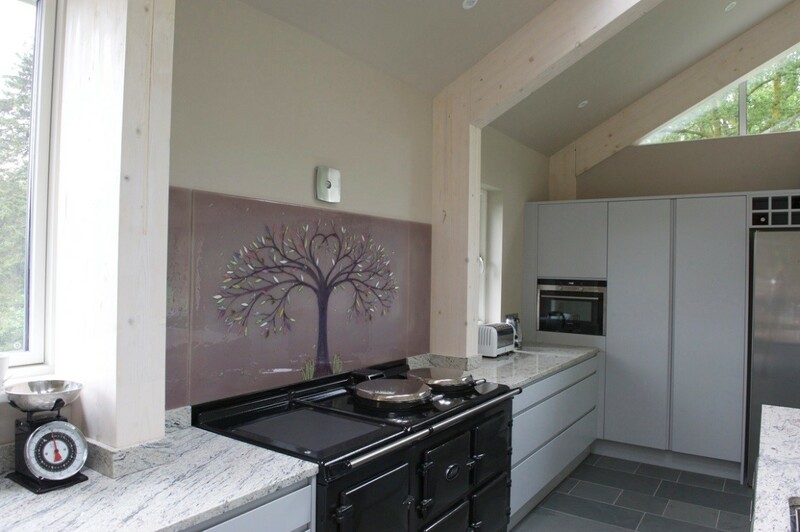 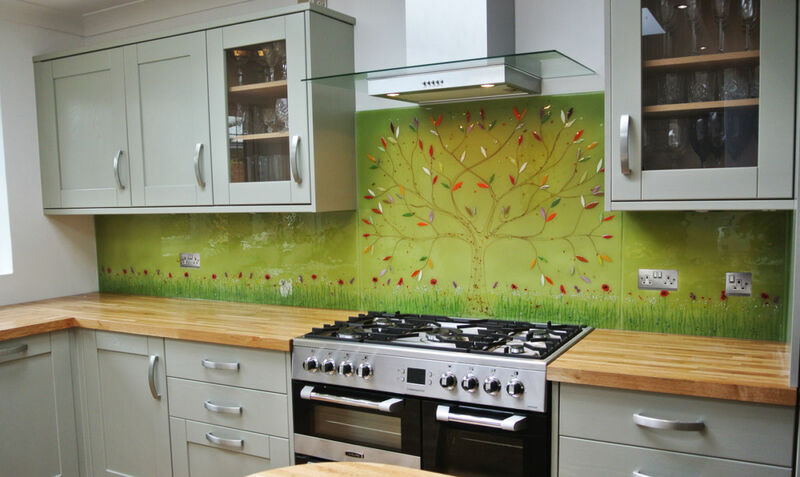 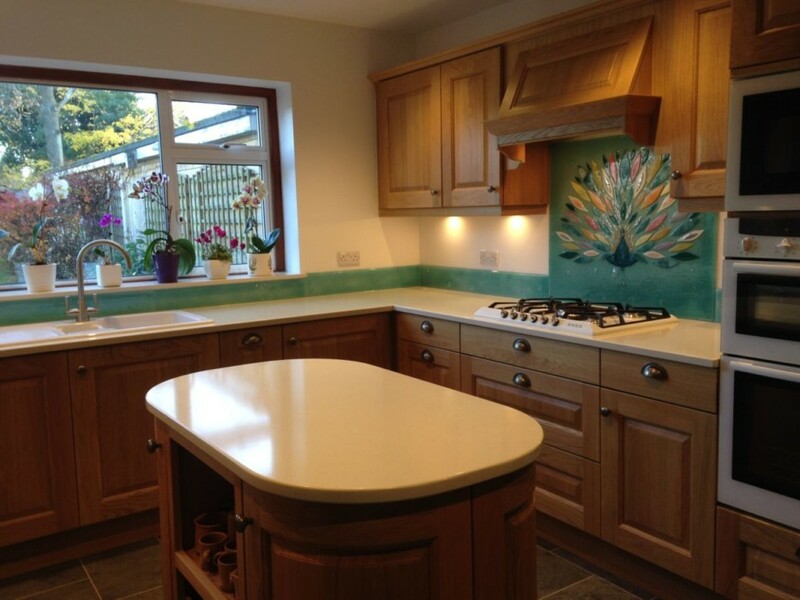 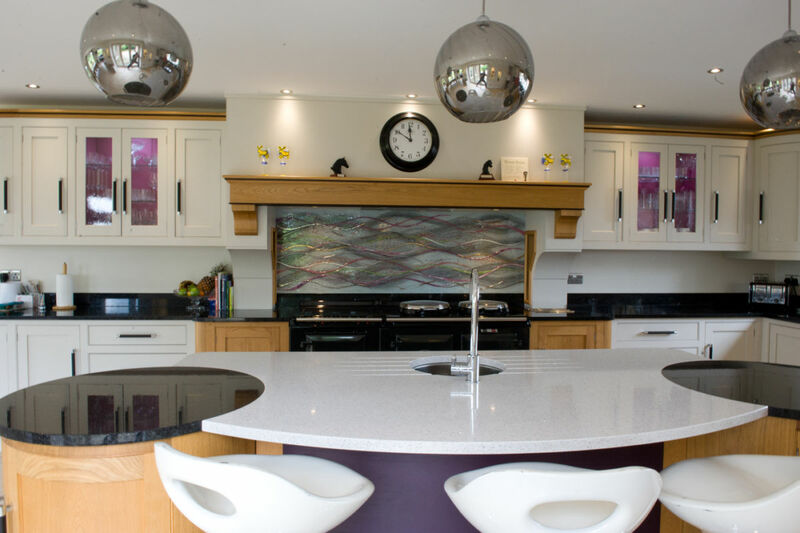 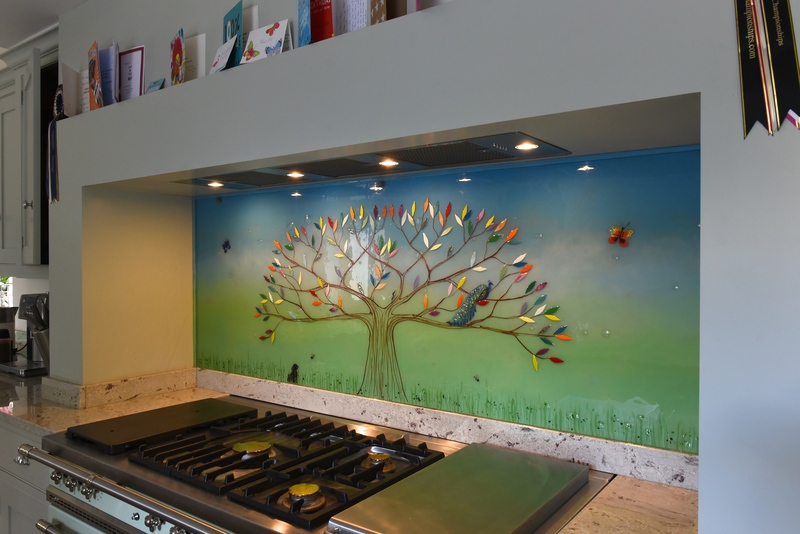 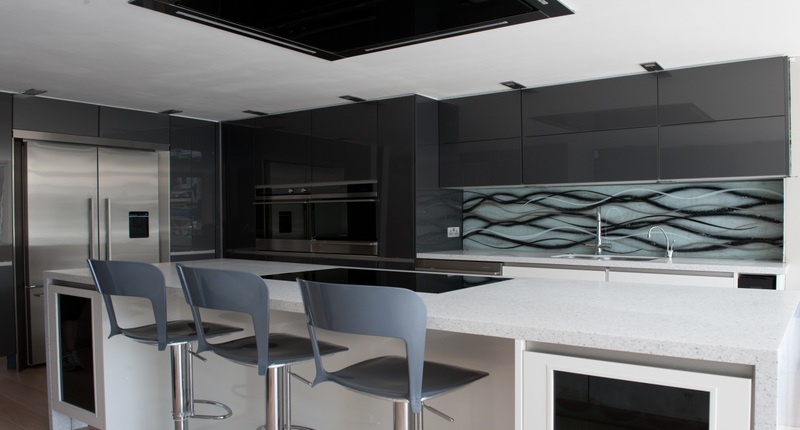 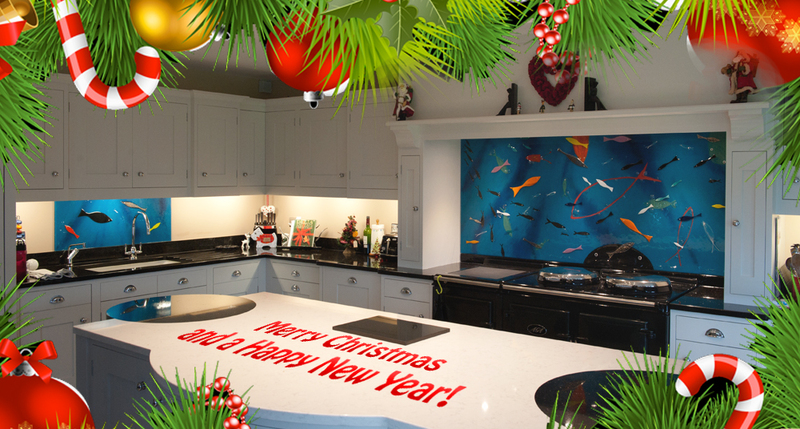 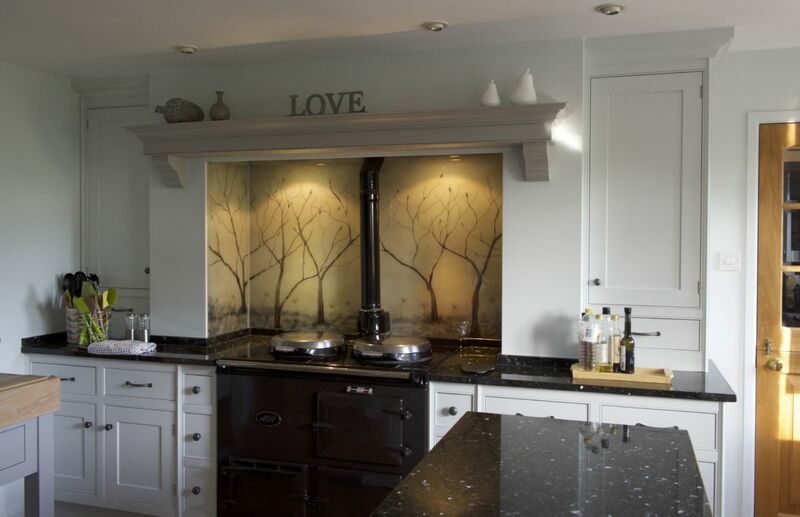 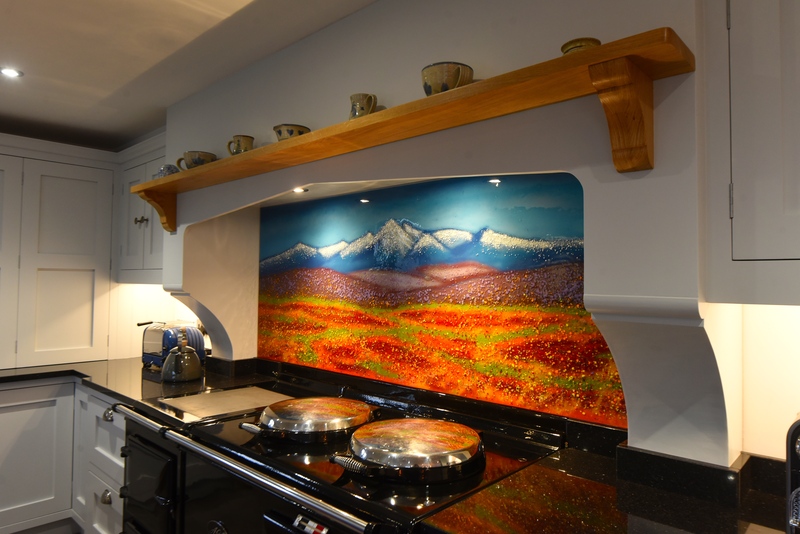 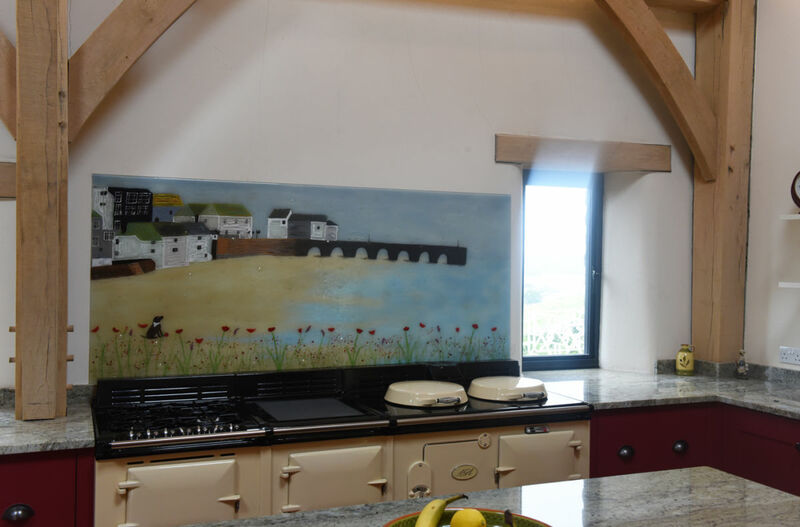 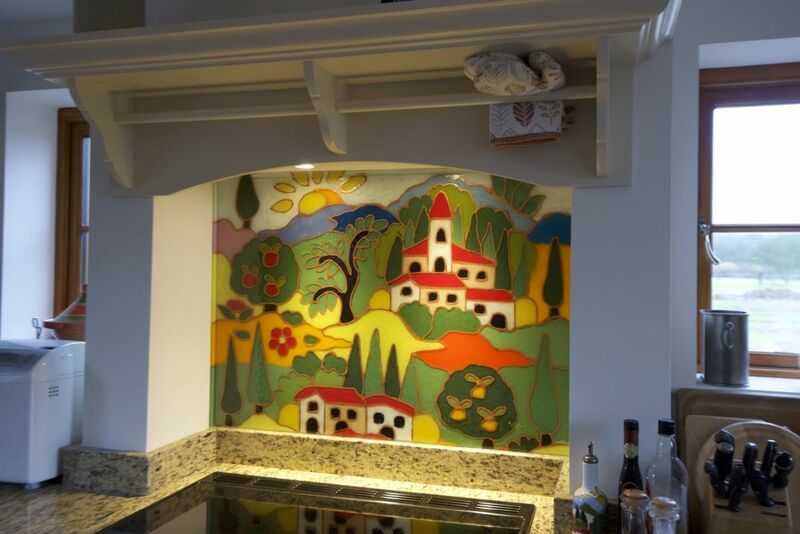 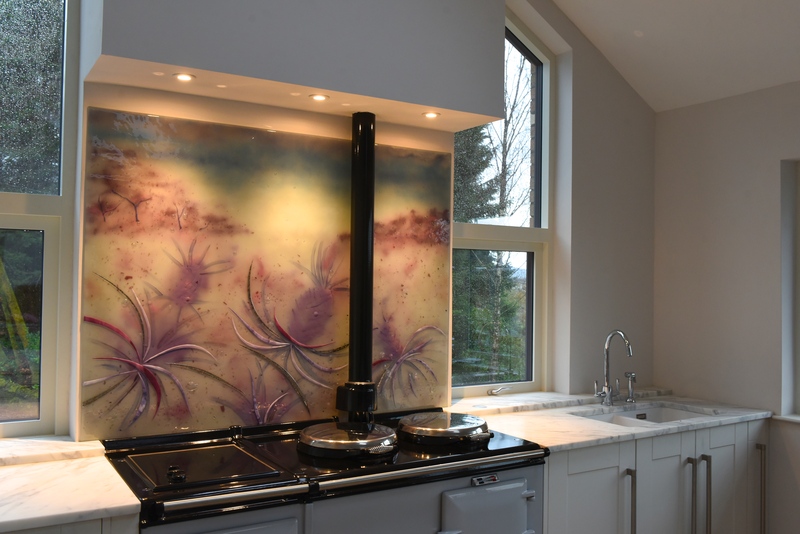 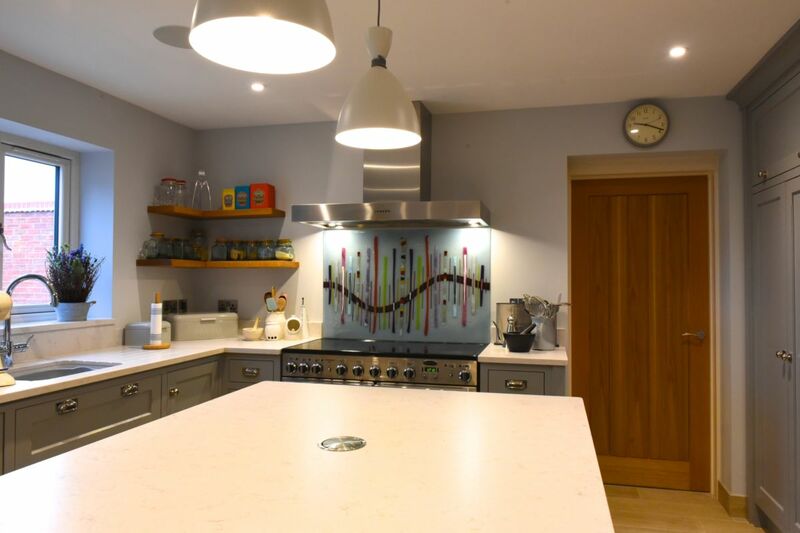 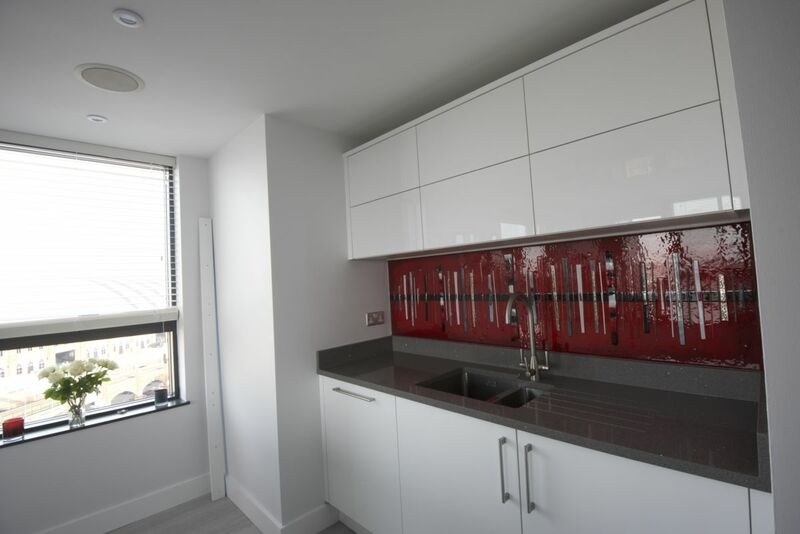 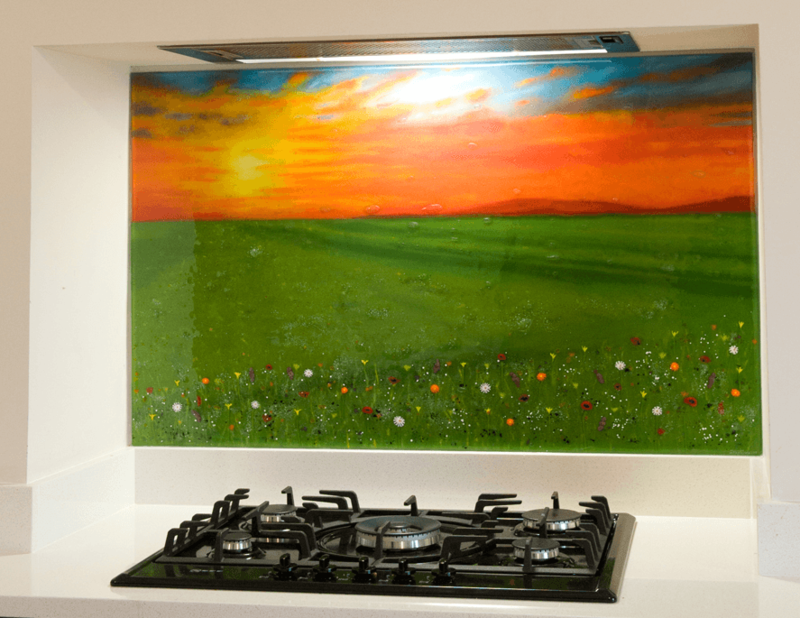 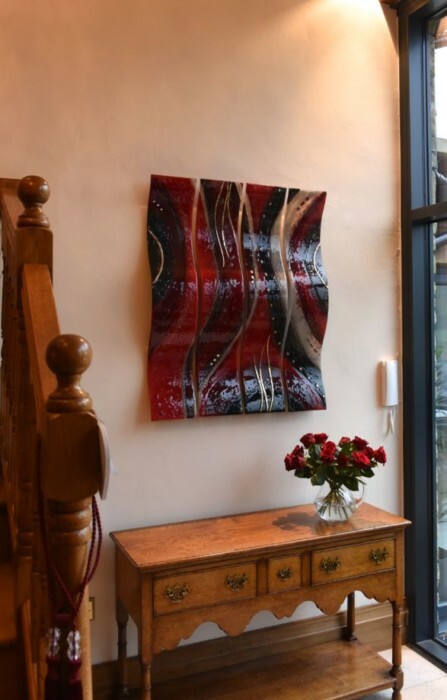 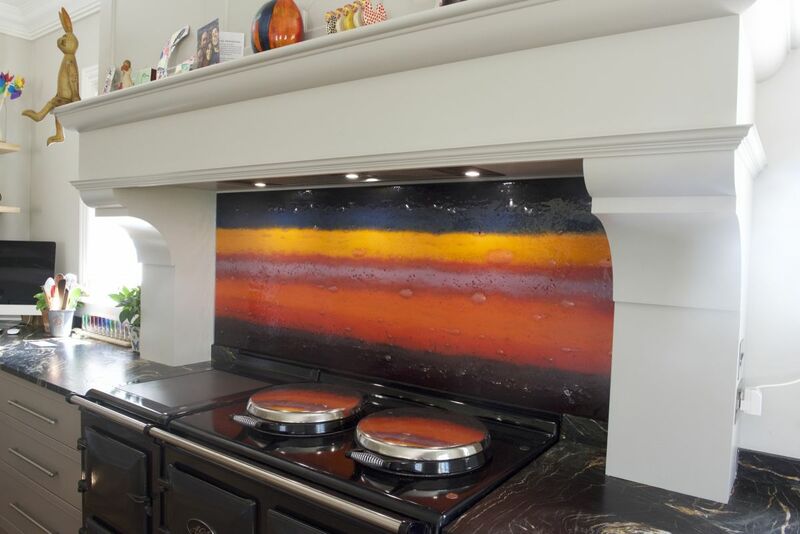 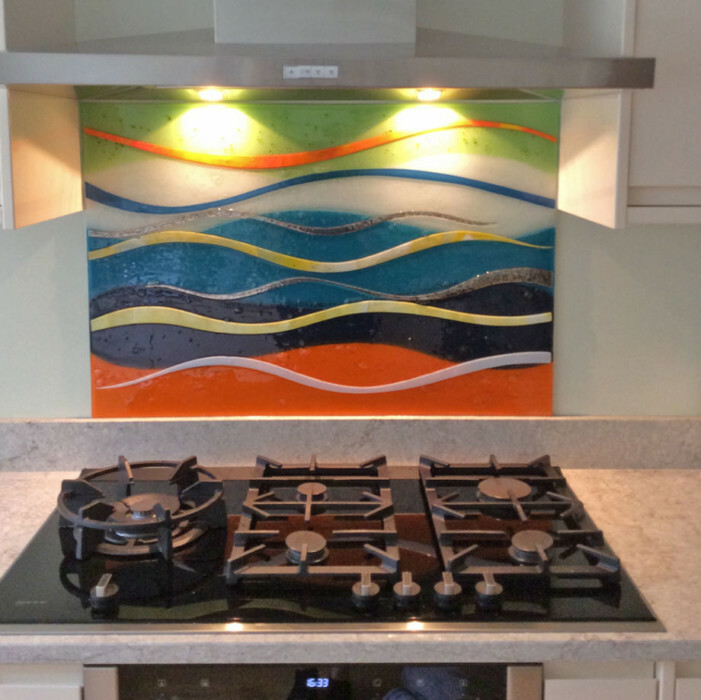 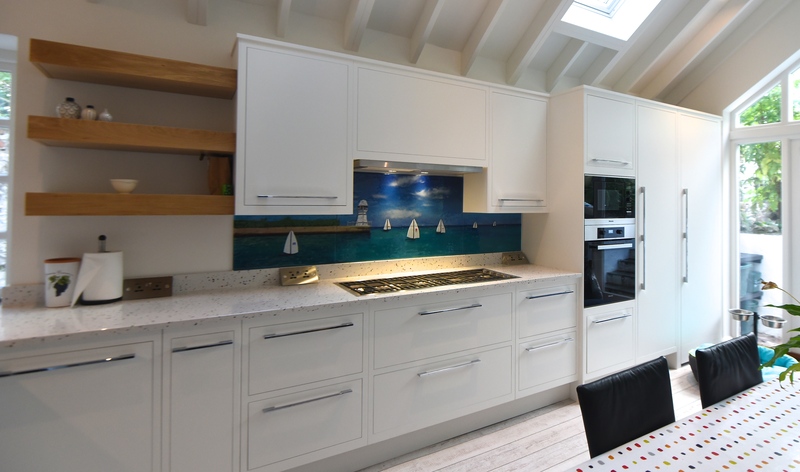 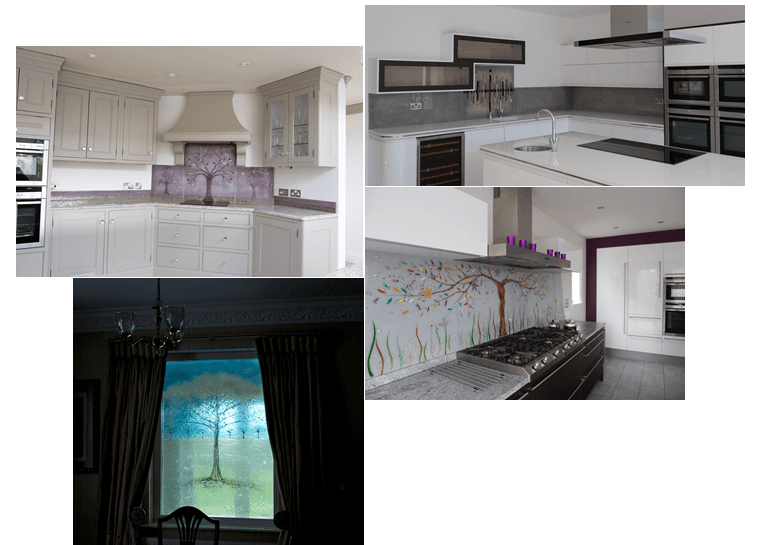 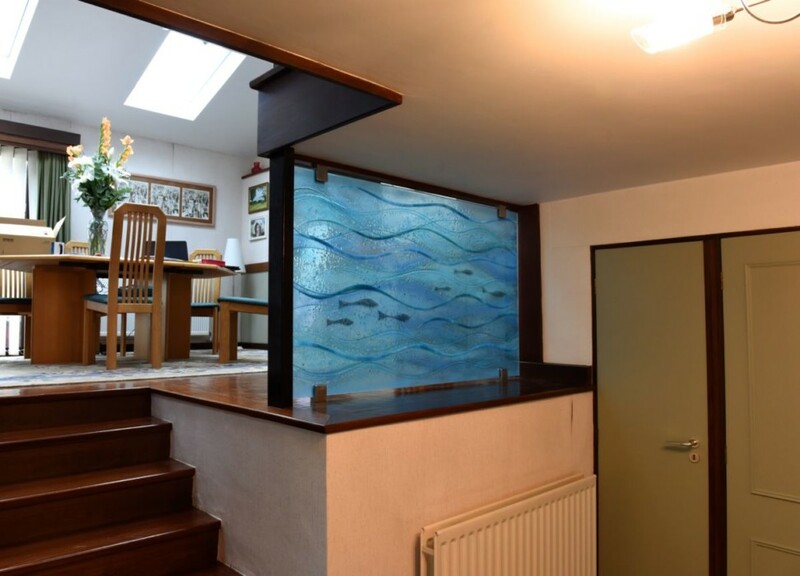 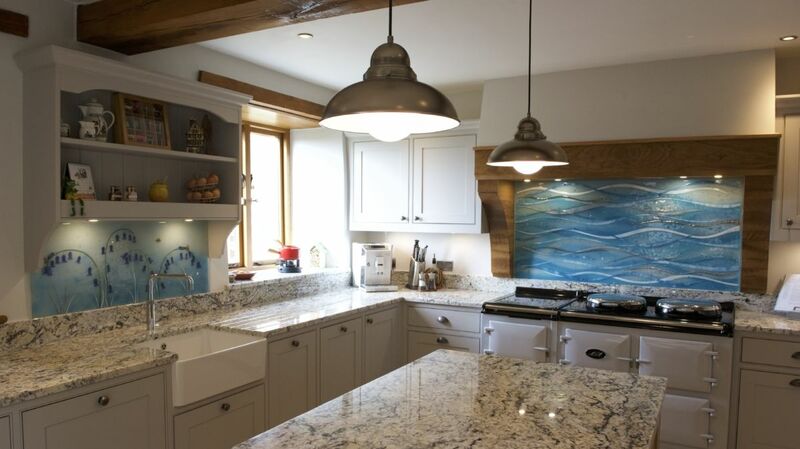 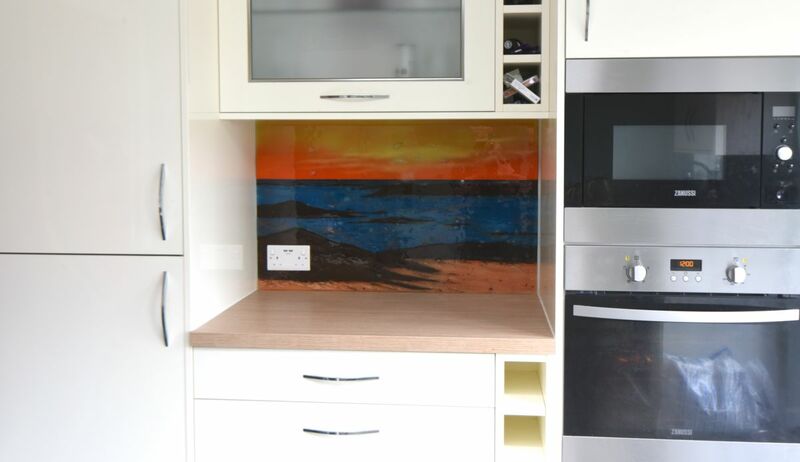 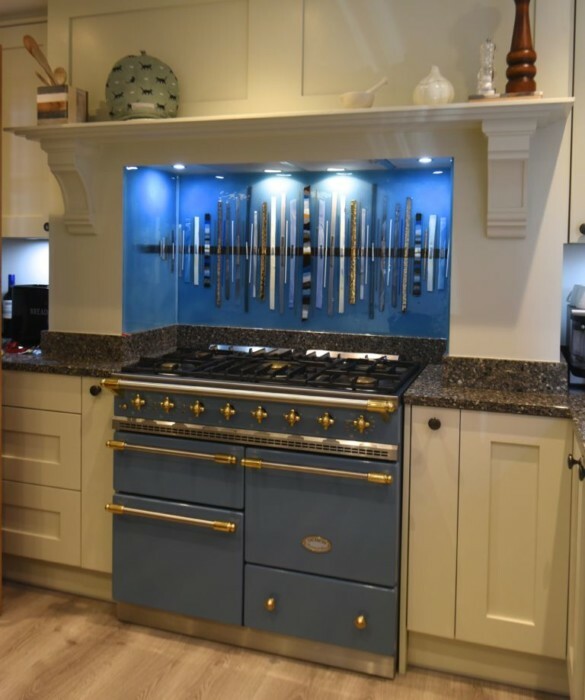 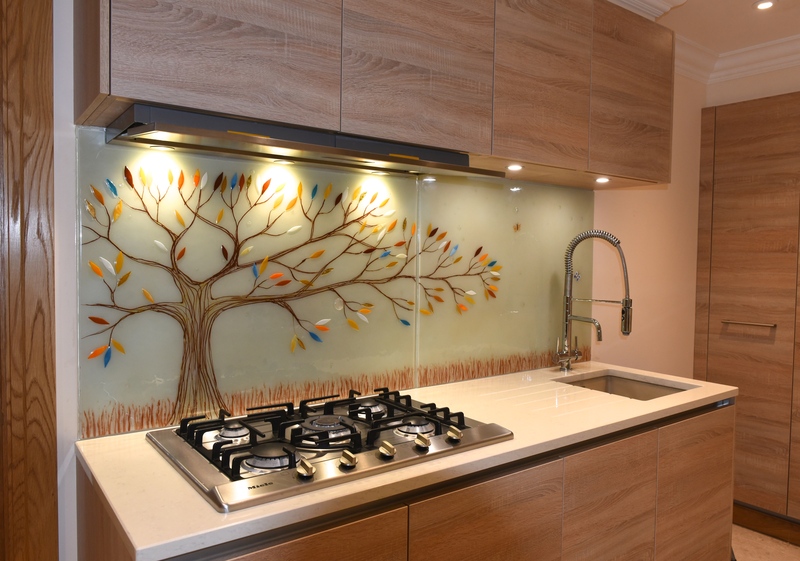 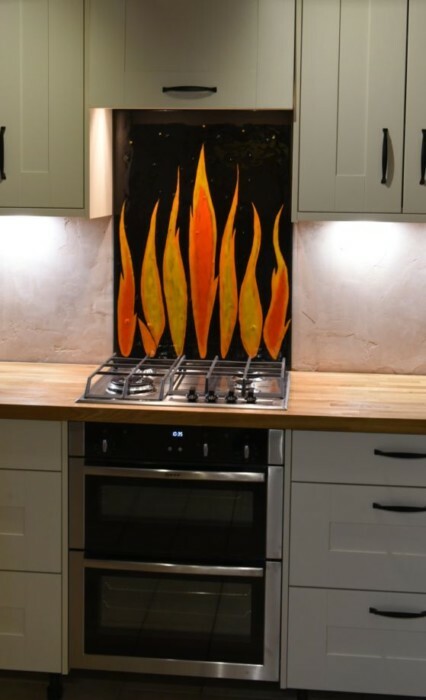 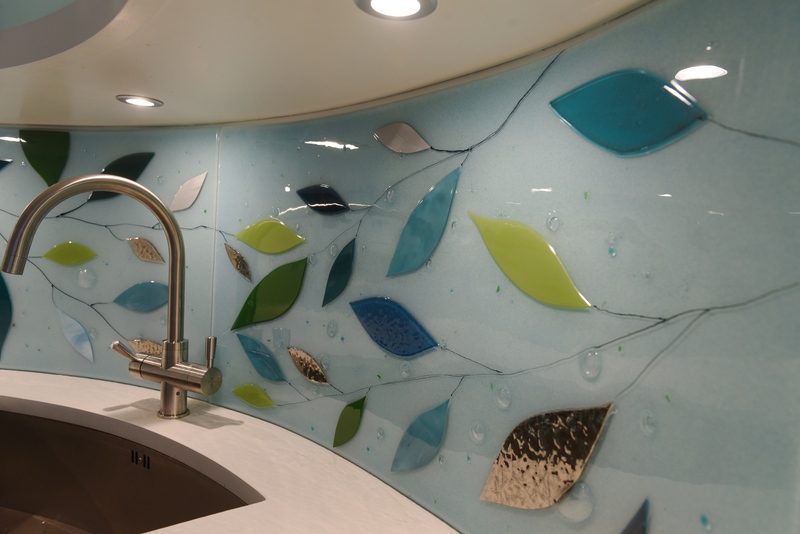 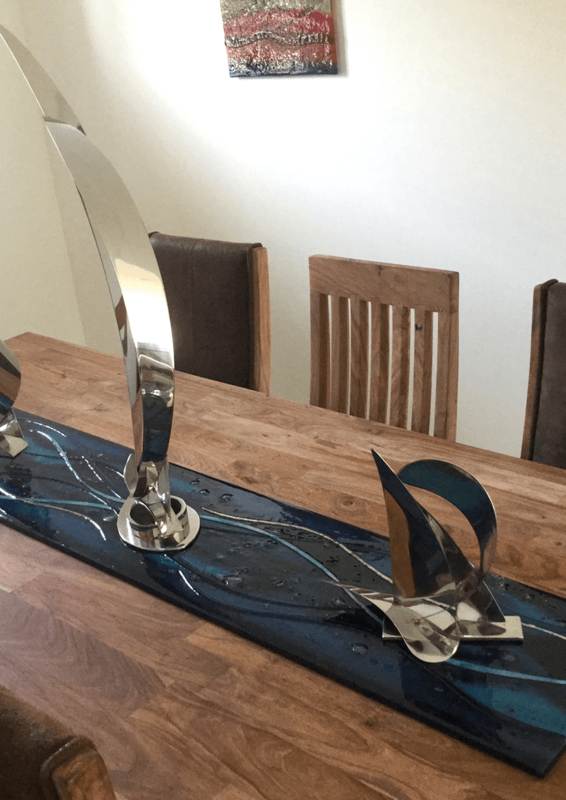 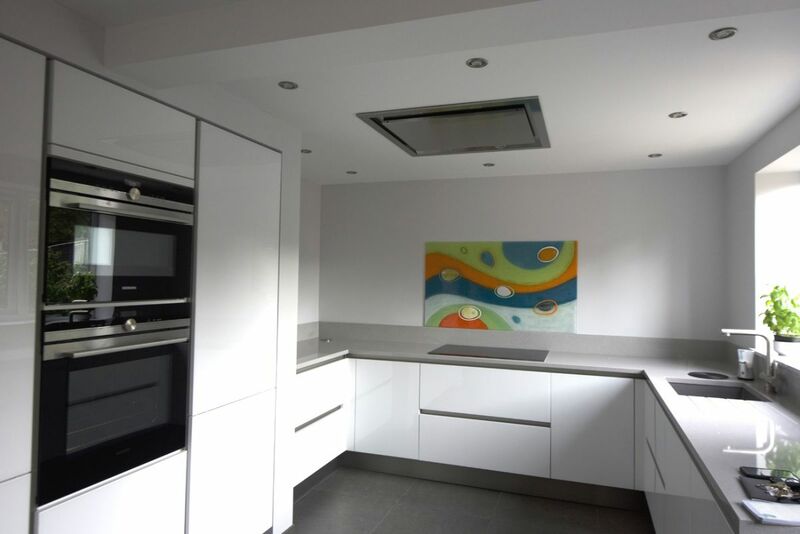 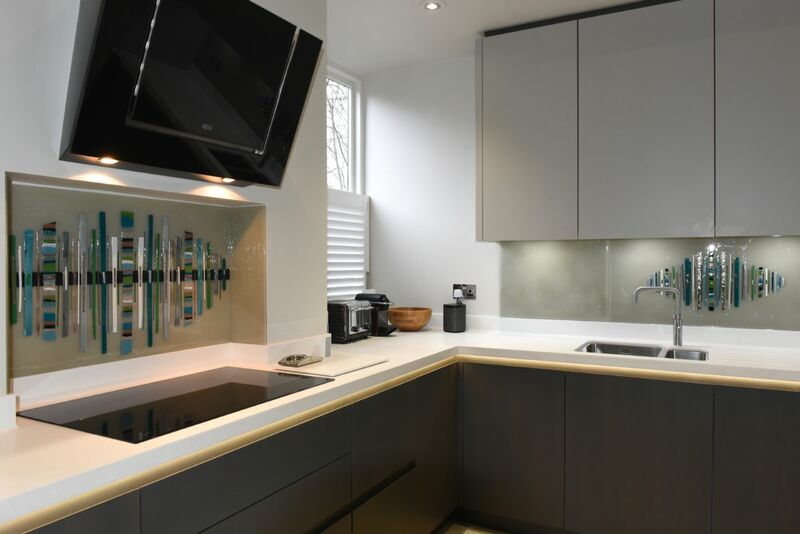 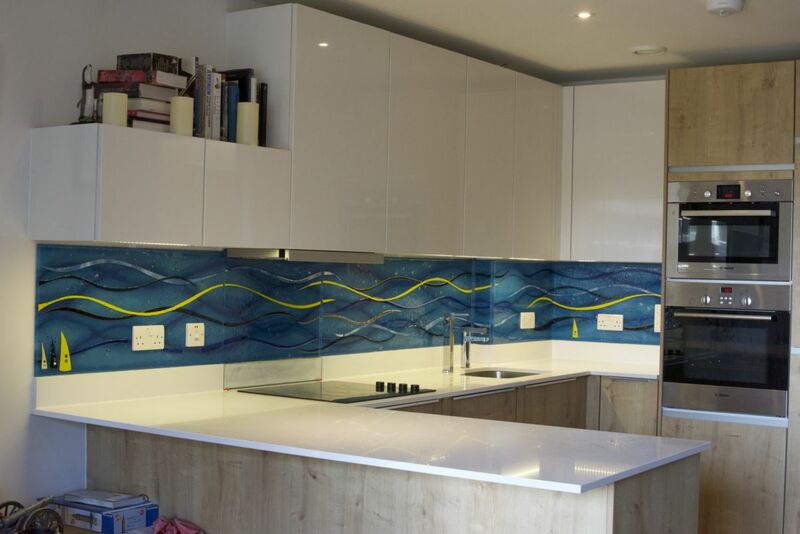 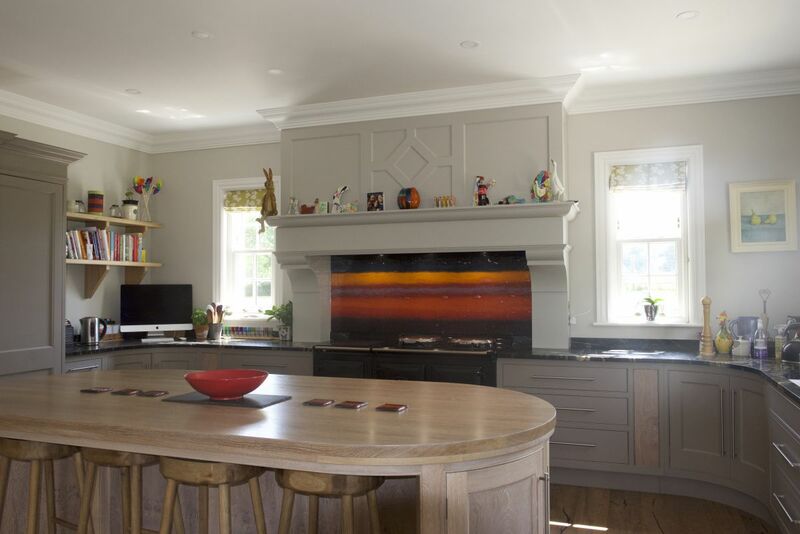 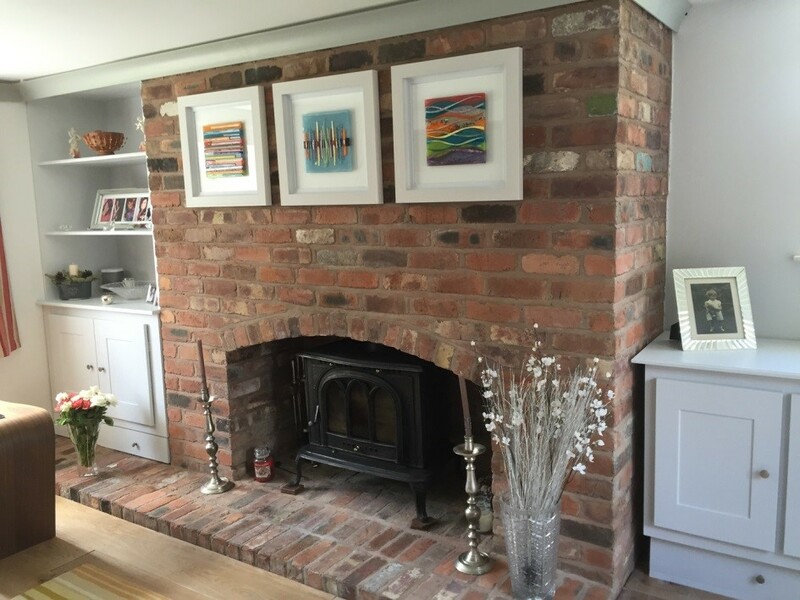 Here’s a very recent piece for the blog, and it’s a real stunner that we can confidently call one of the best bespoke glass splashbacks Urmston has ever received from us! 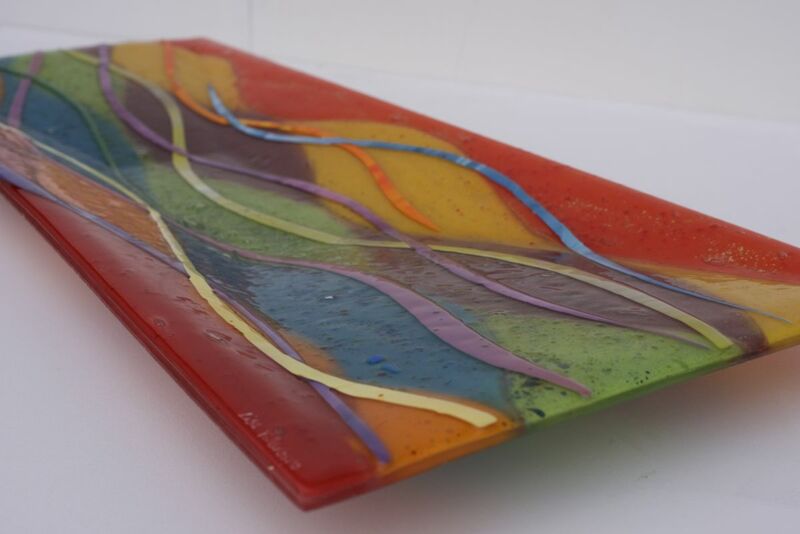 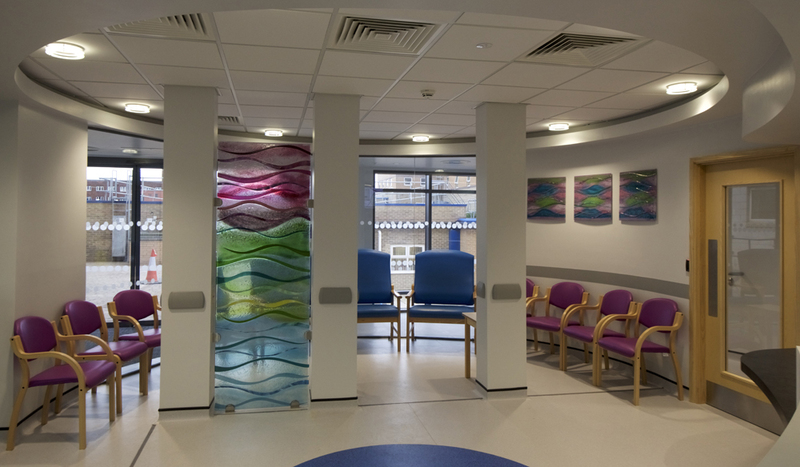 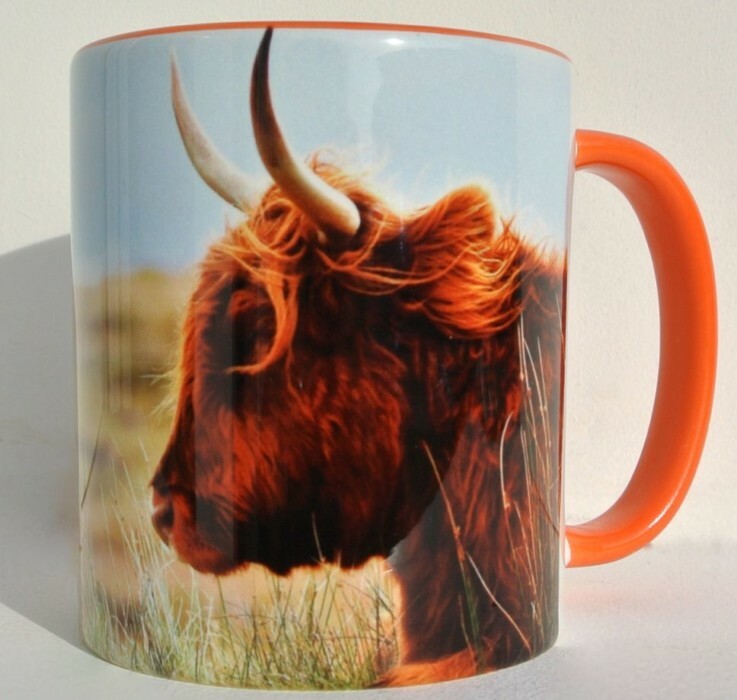 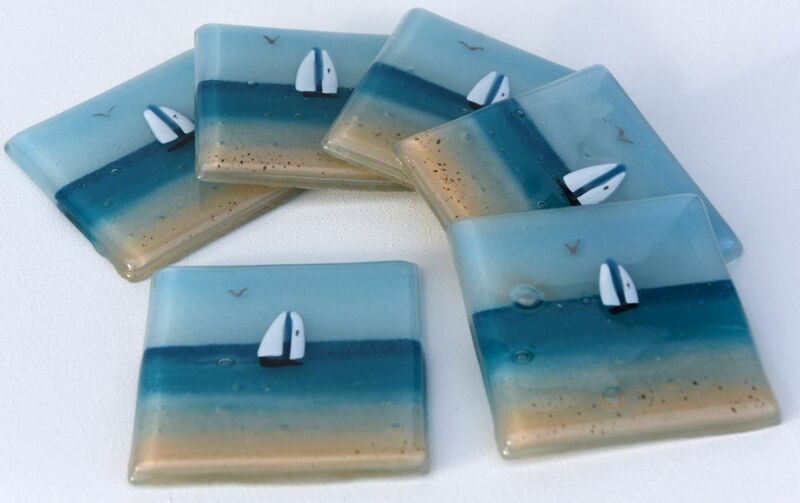 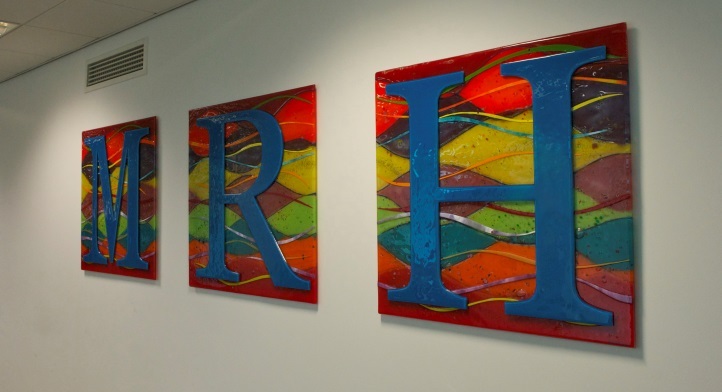 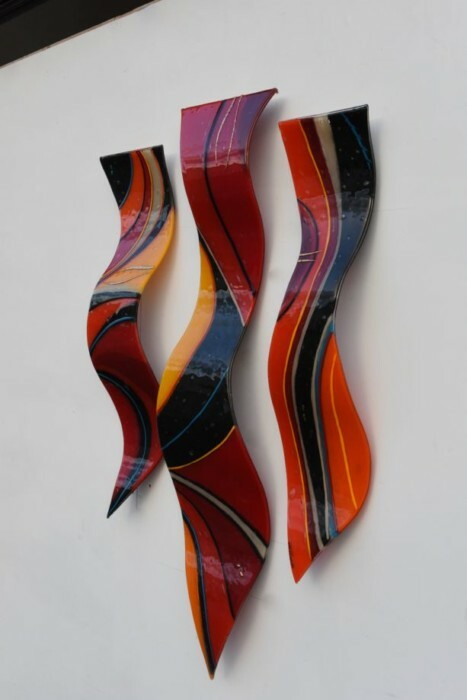 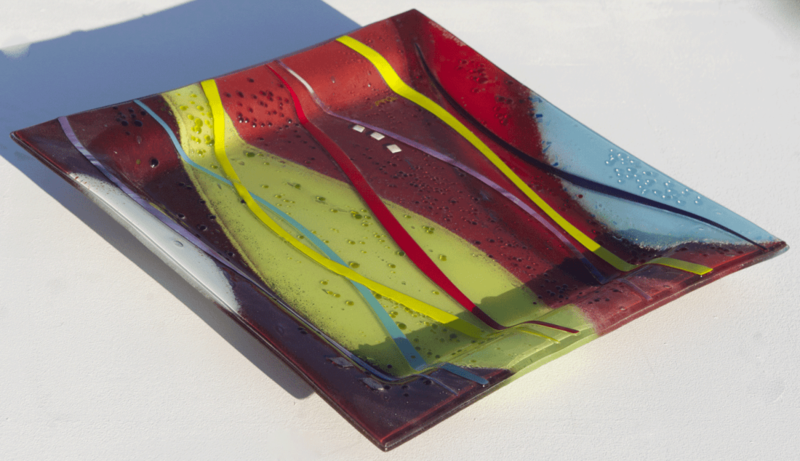 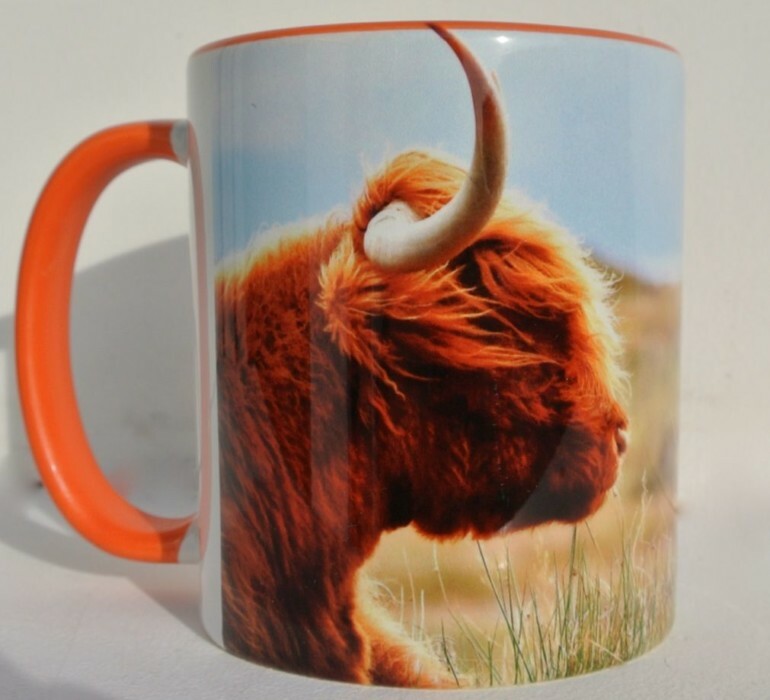 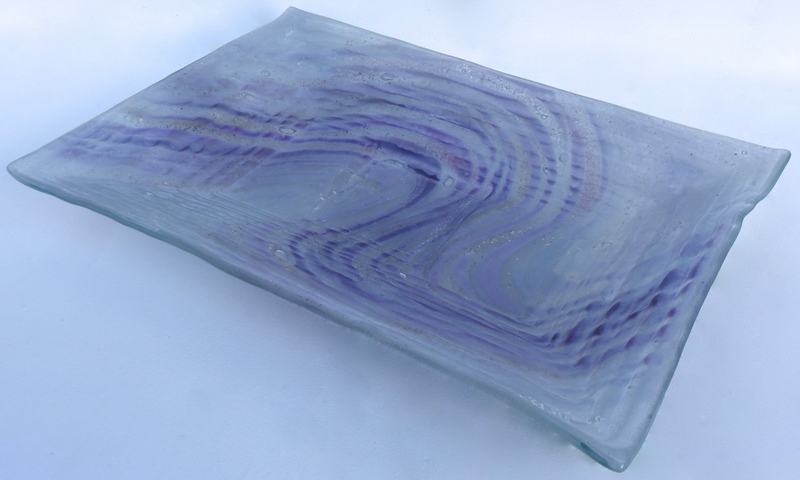 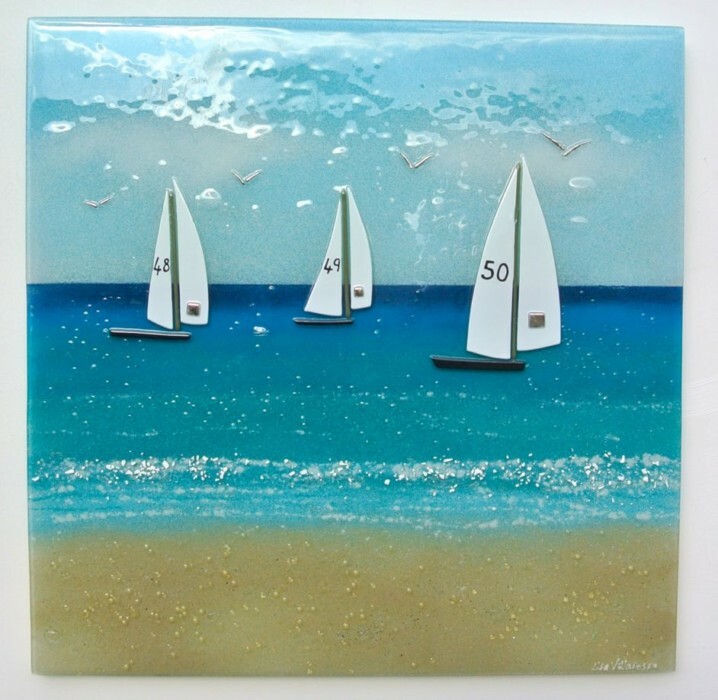 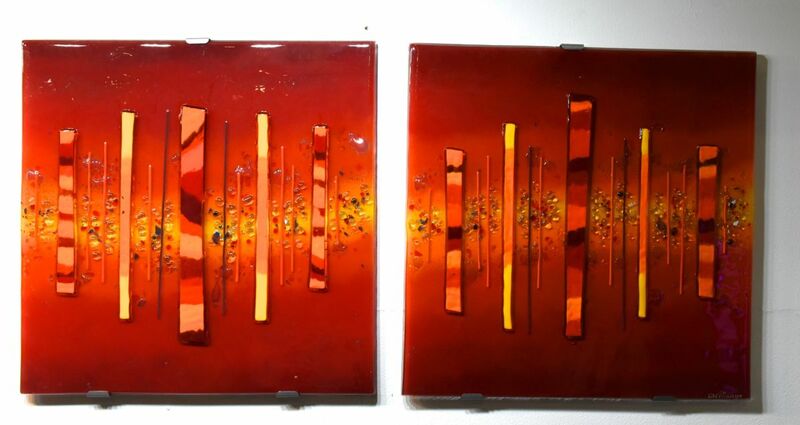 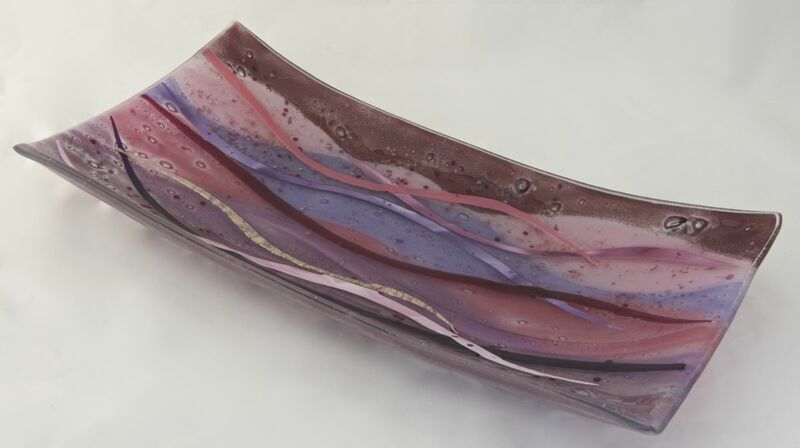 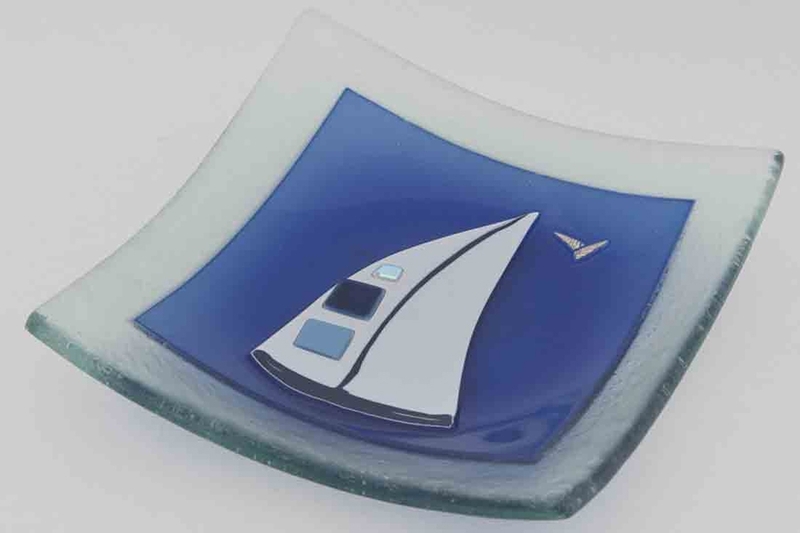 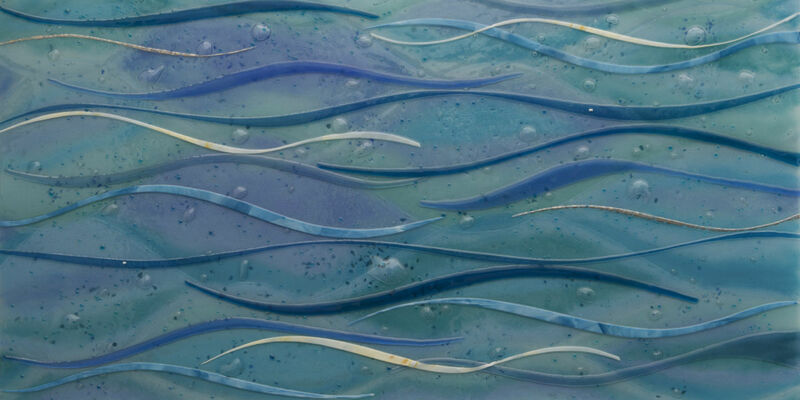 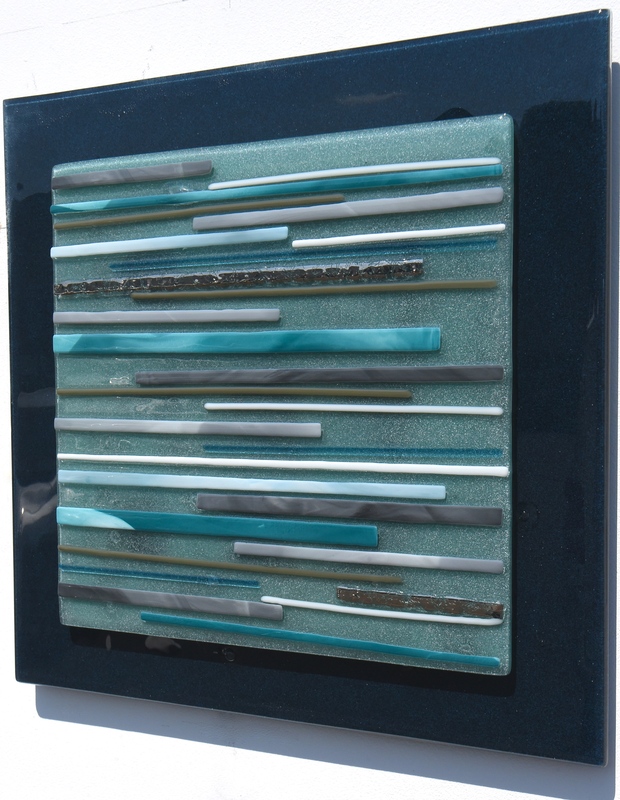 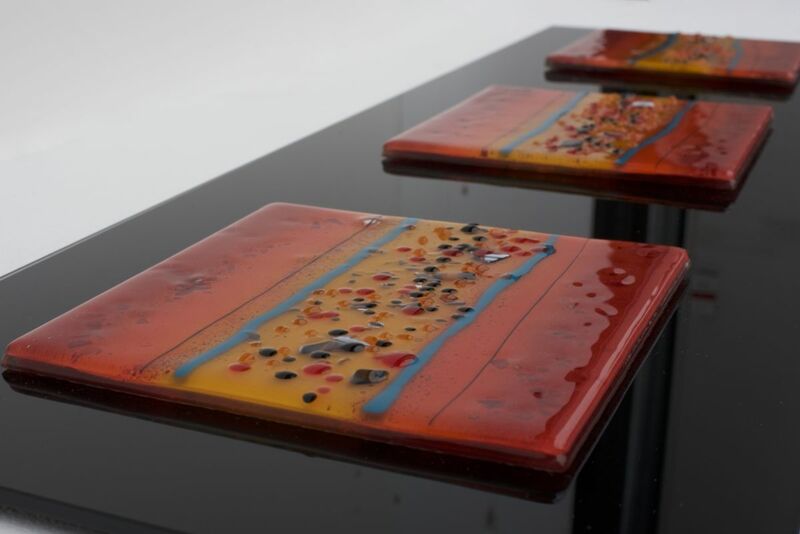 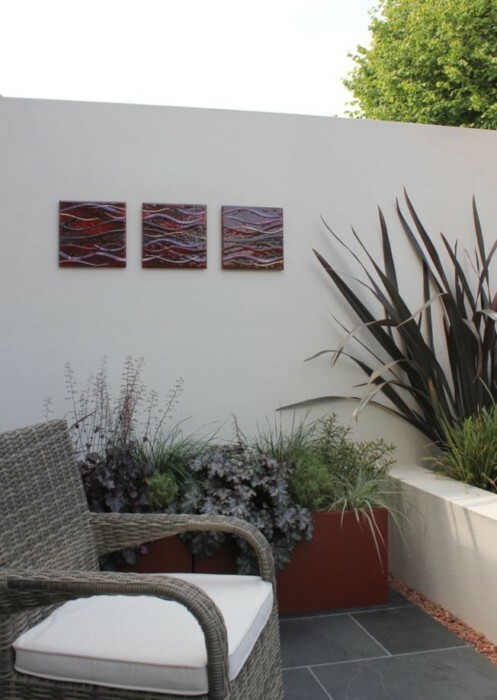 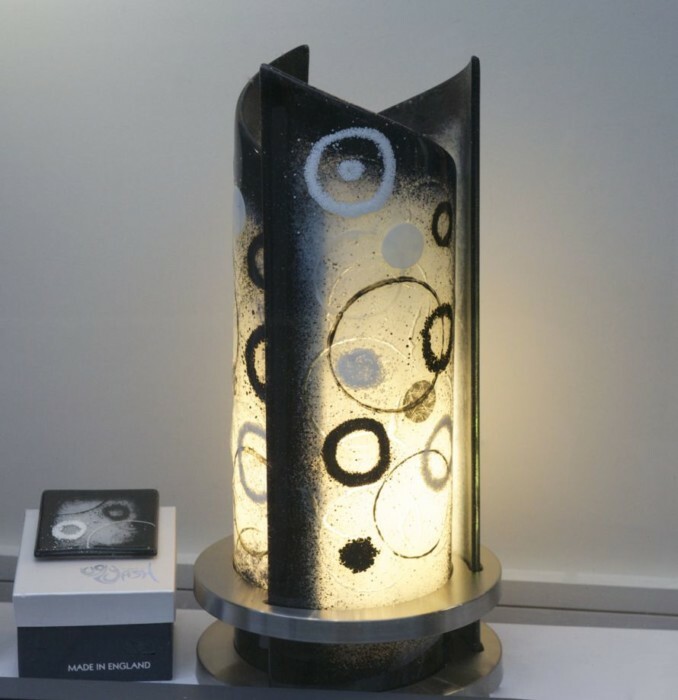 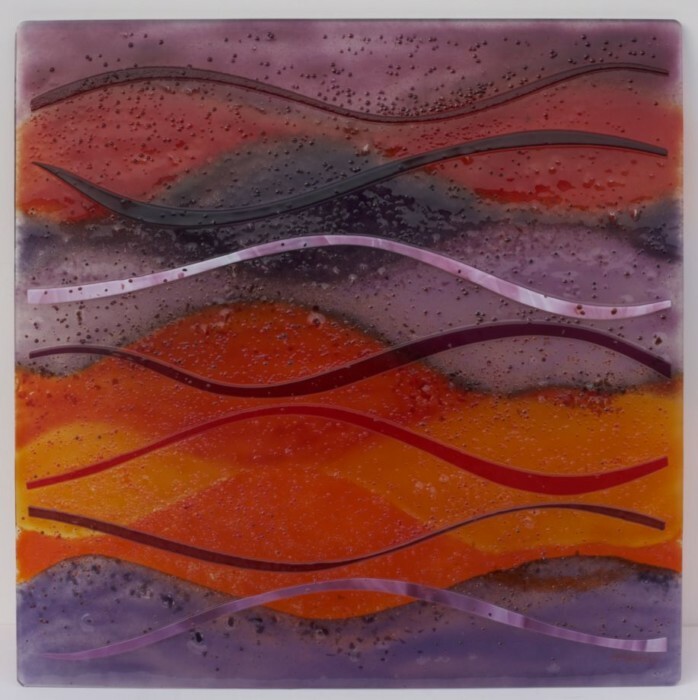 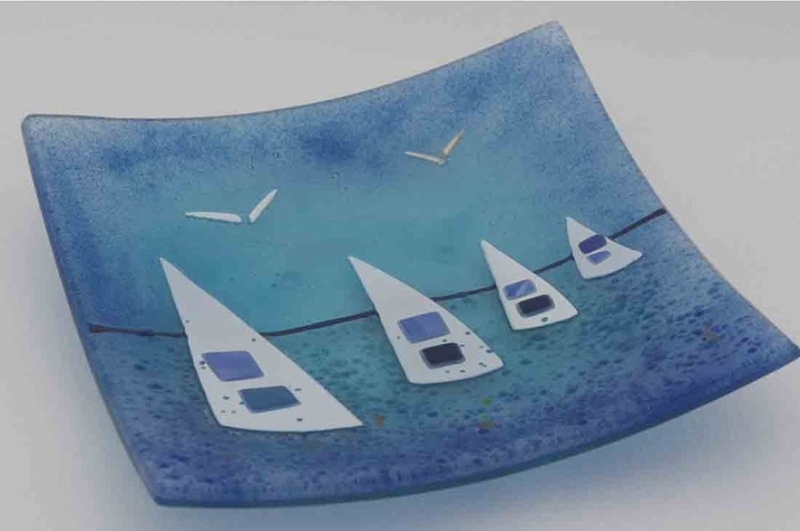 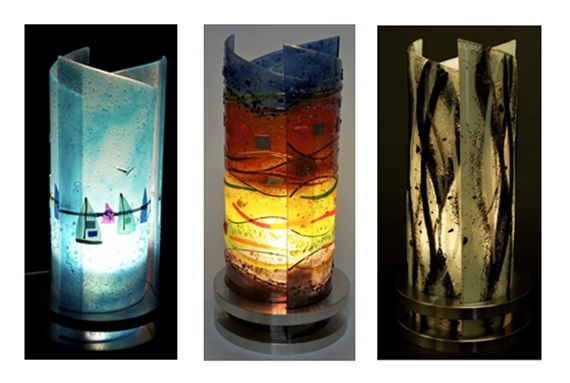 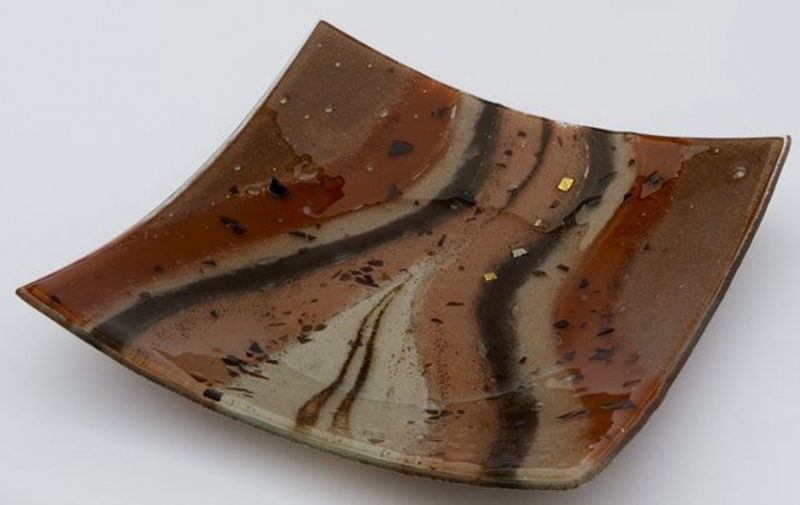 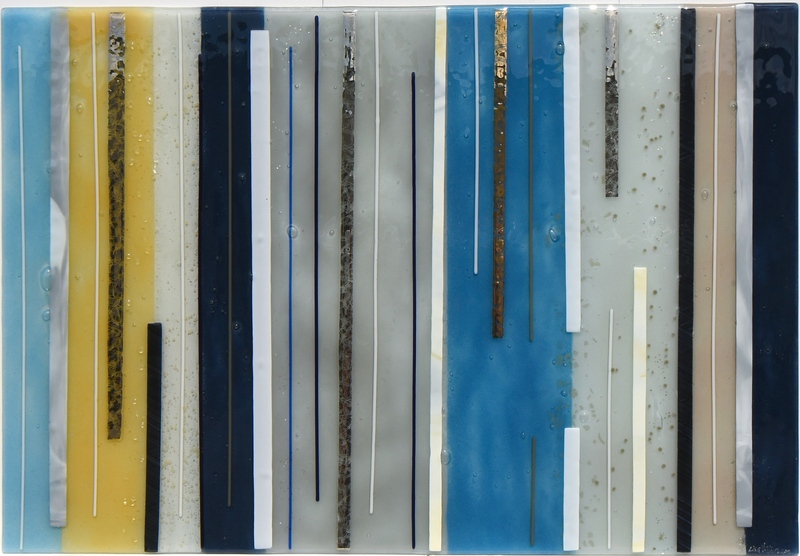 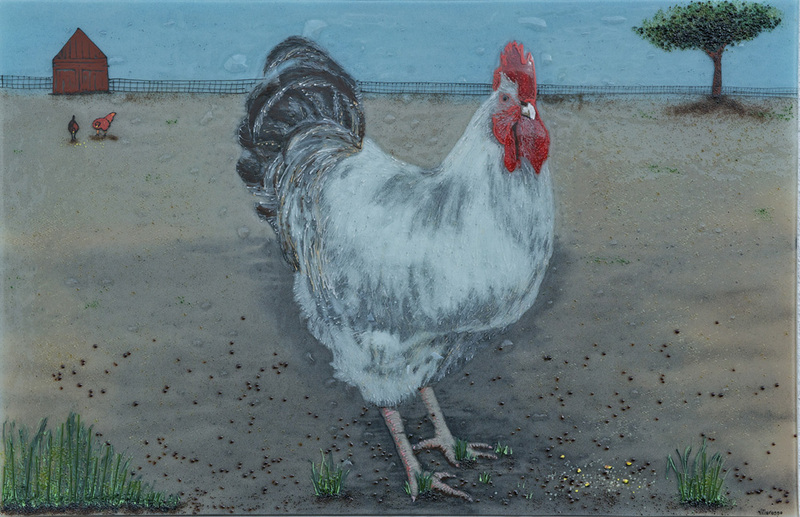 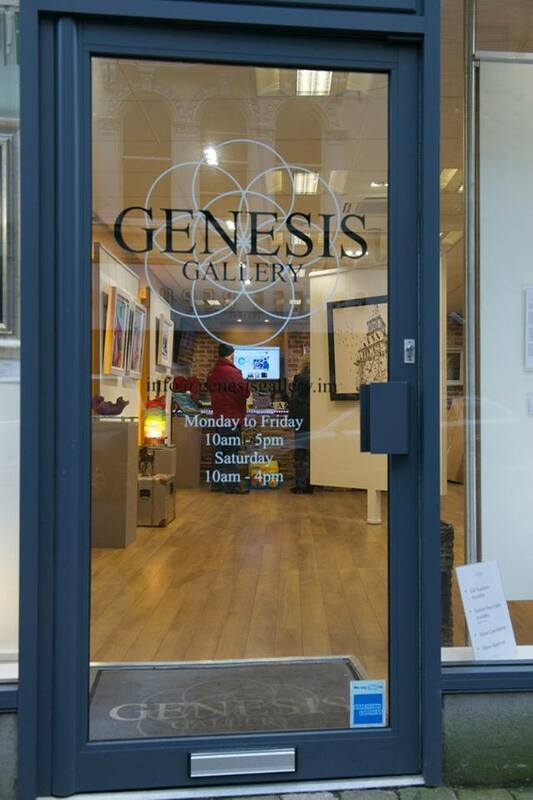 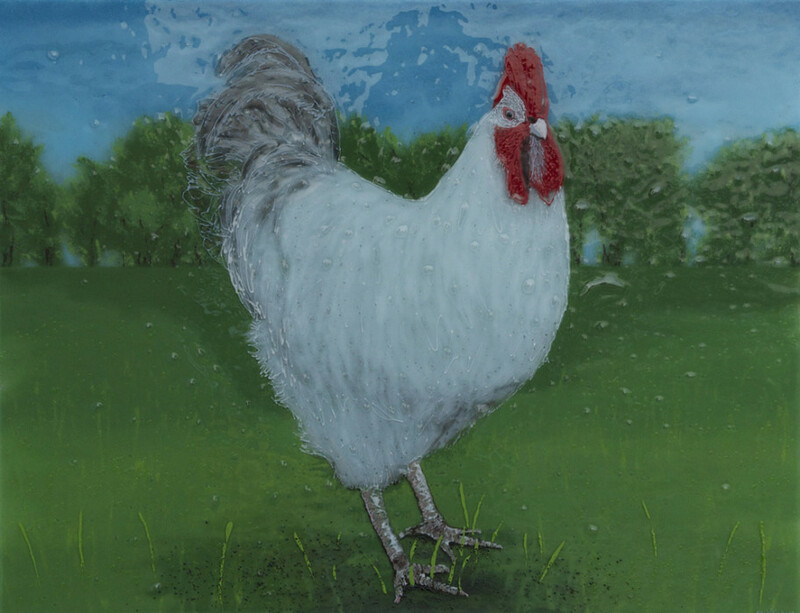 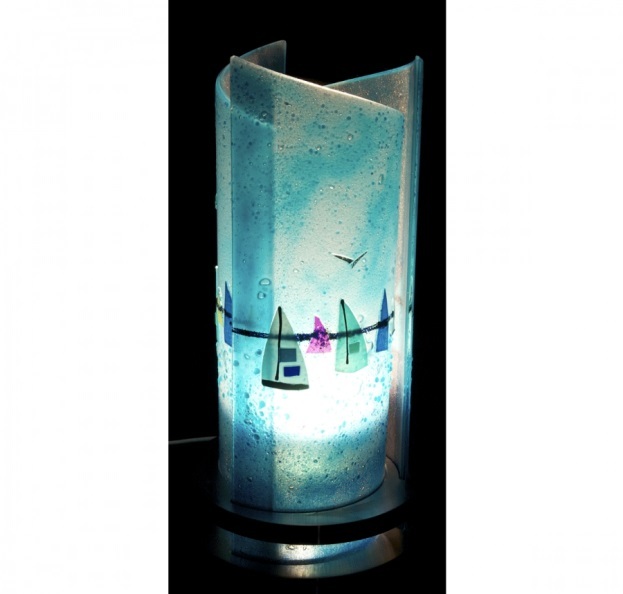 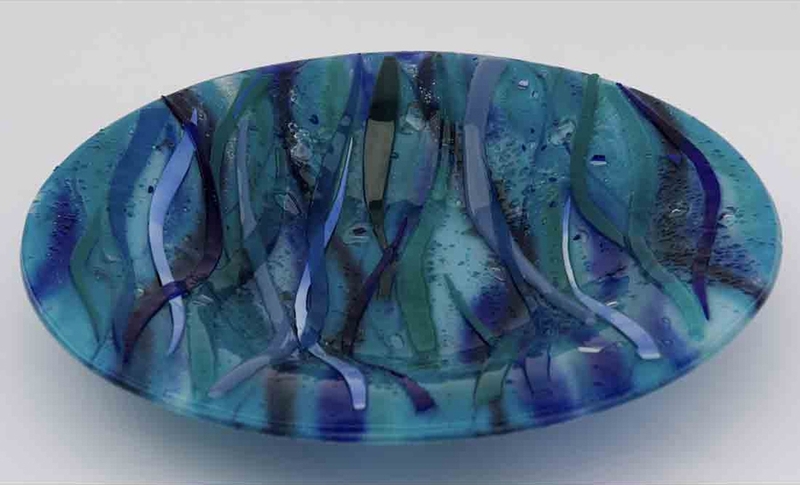 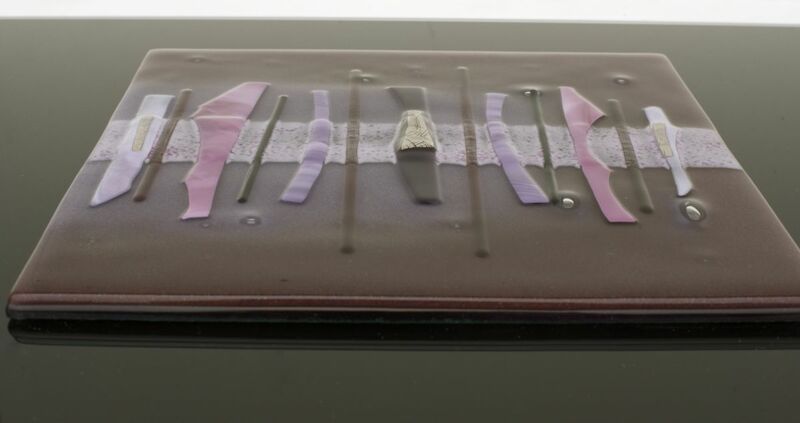 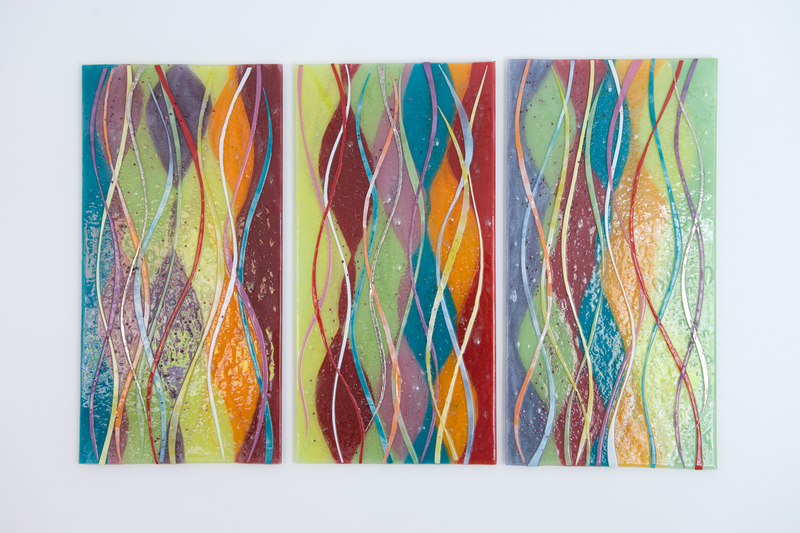 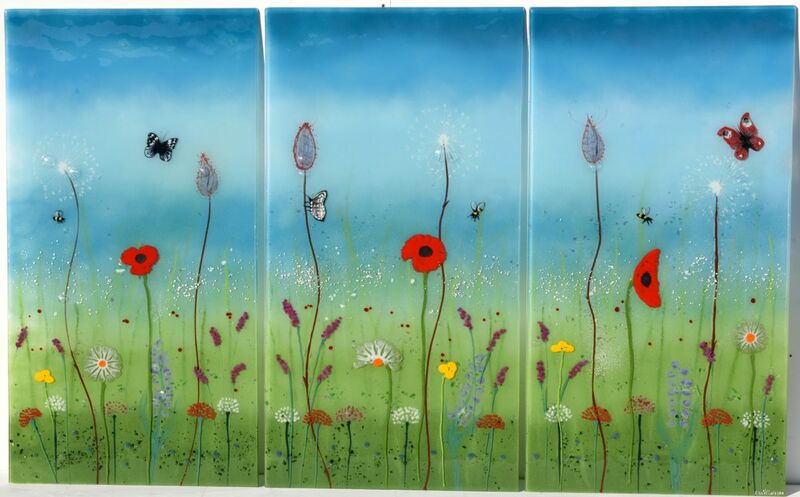 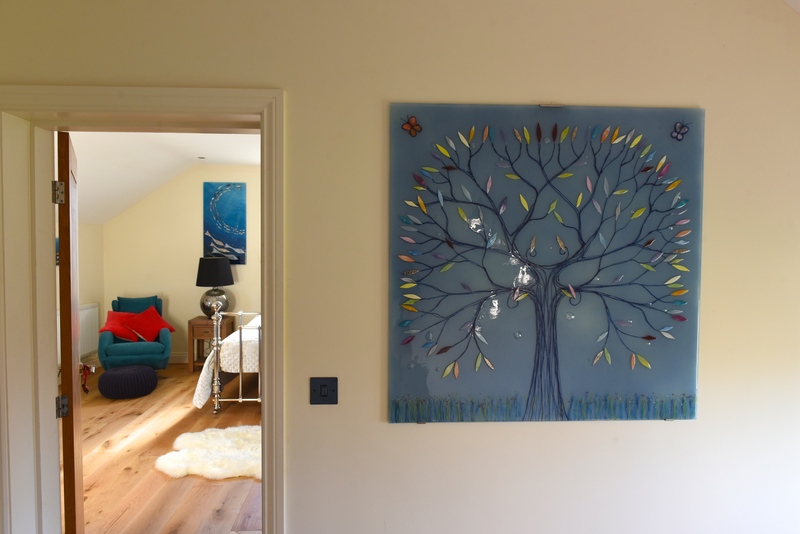 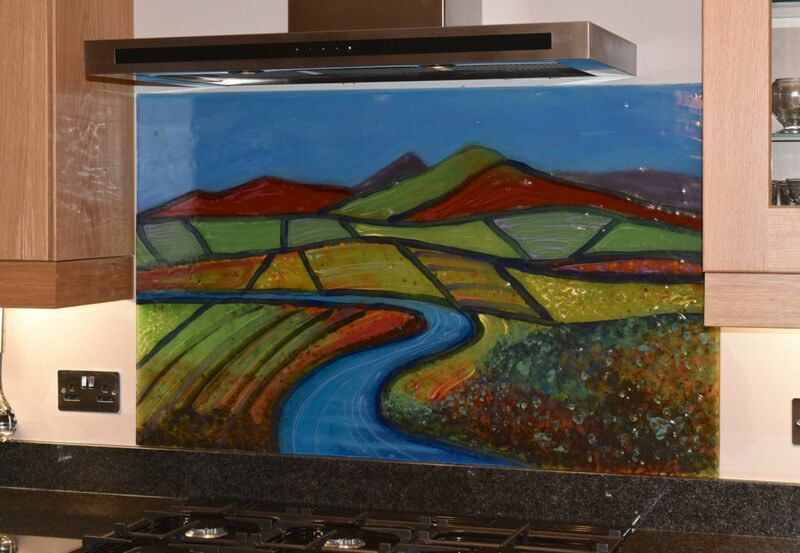 The customer was looking for a certain kind of design, and definitely made the most of the fact that our fused glass art is completely bespoke and made by hand. 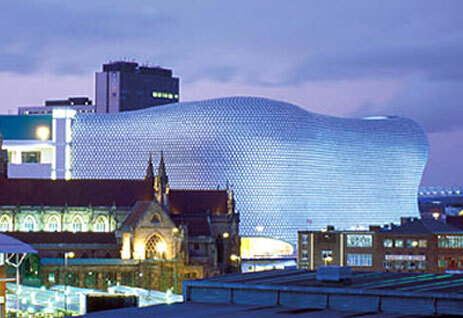 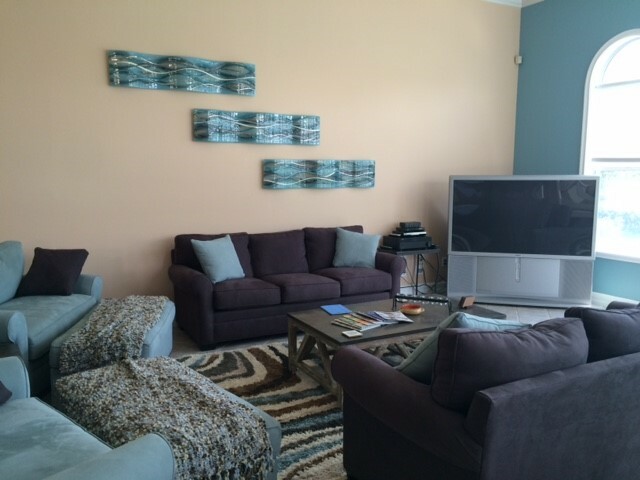 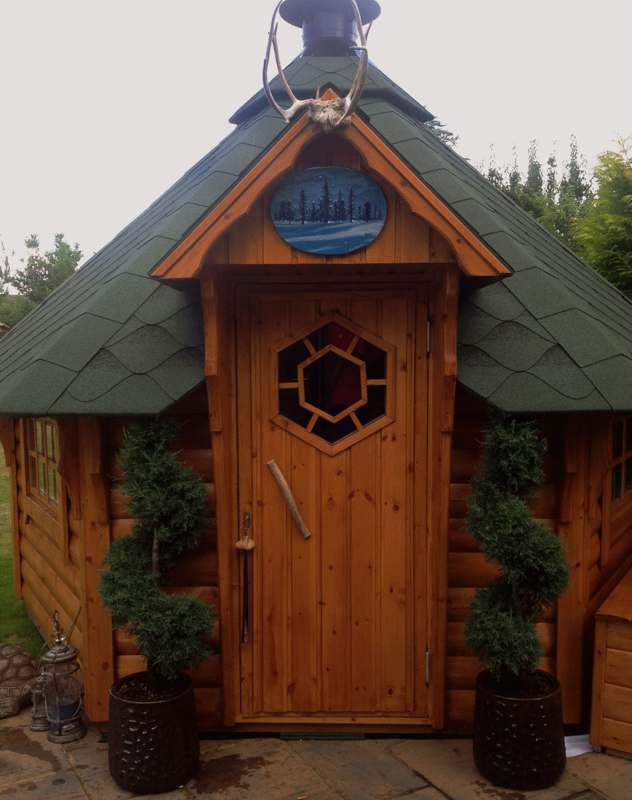 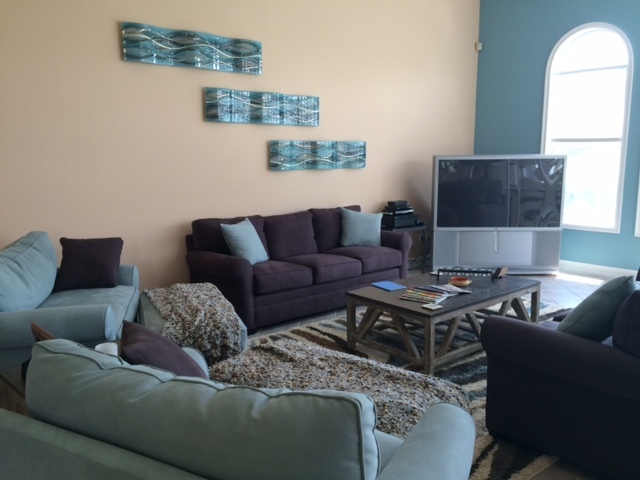 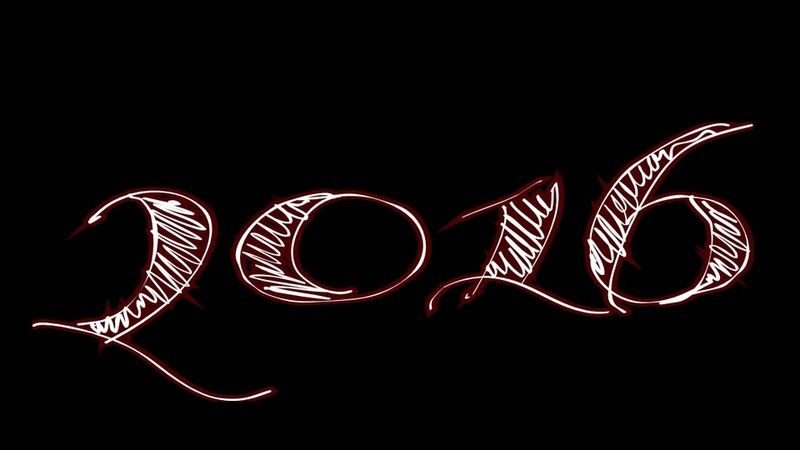 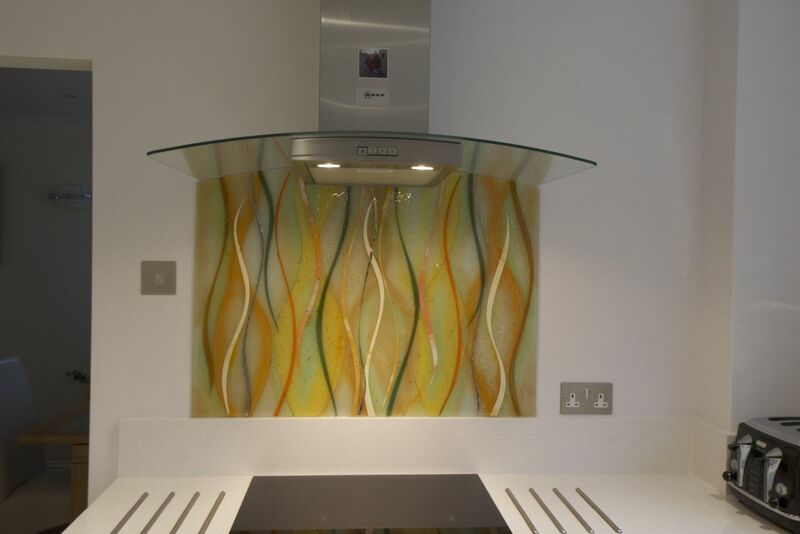 As you can see above, the end result came out looking absolutely beautiful and was just what they wanted. 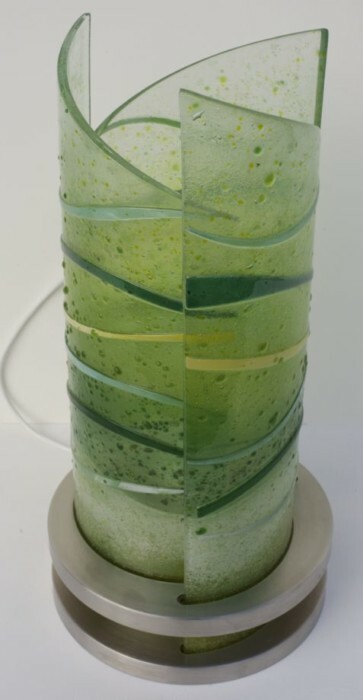 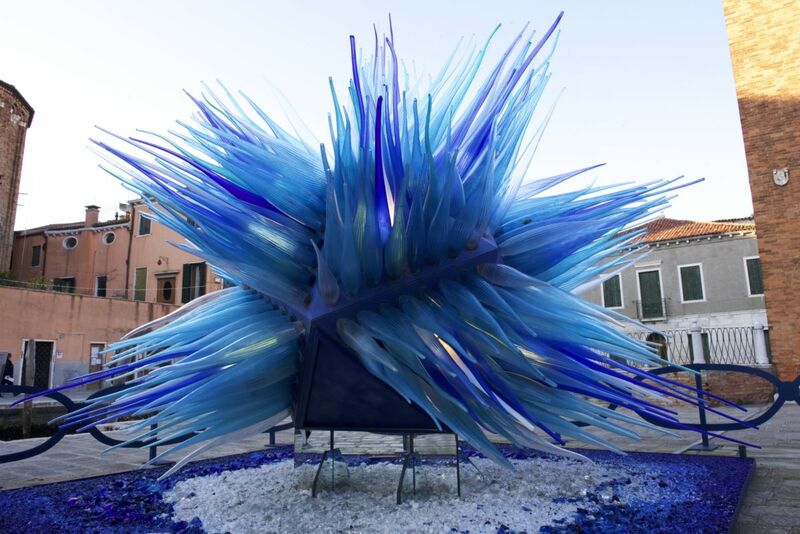 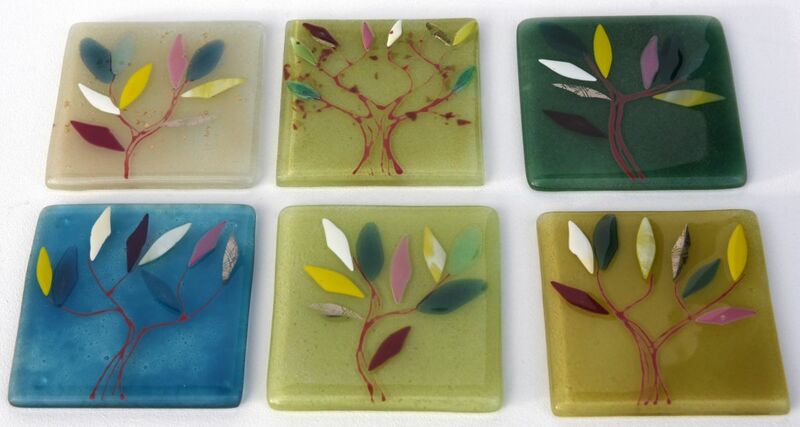 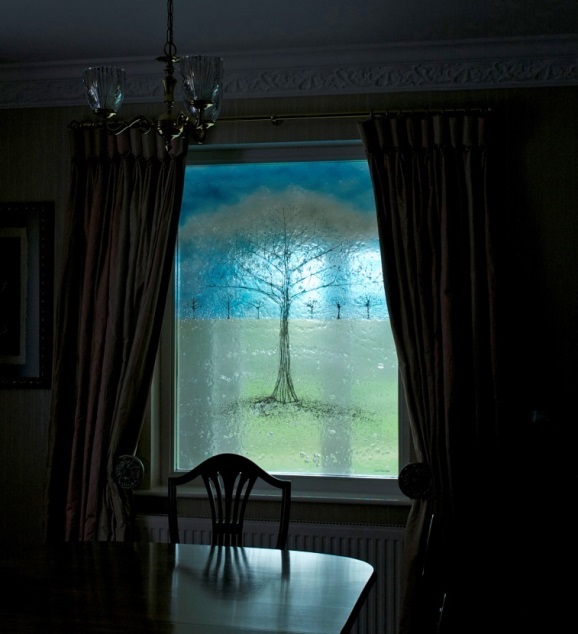 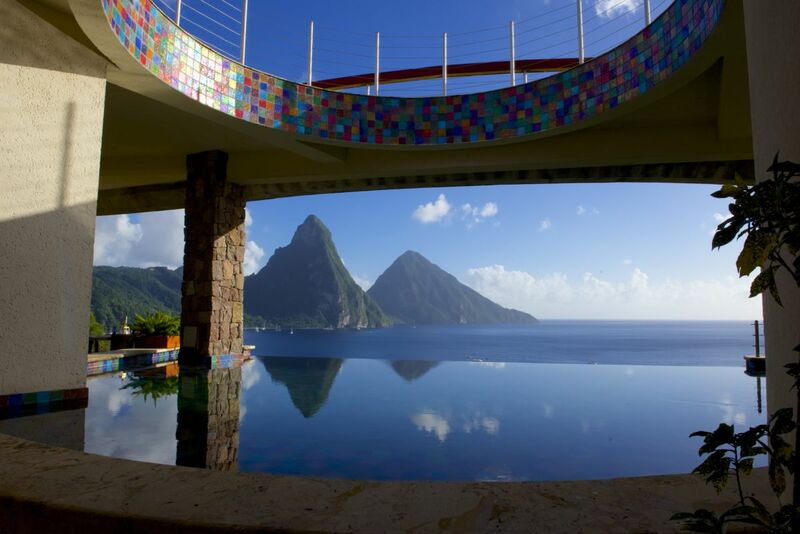 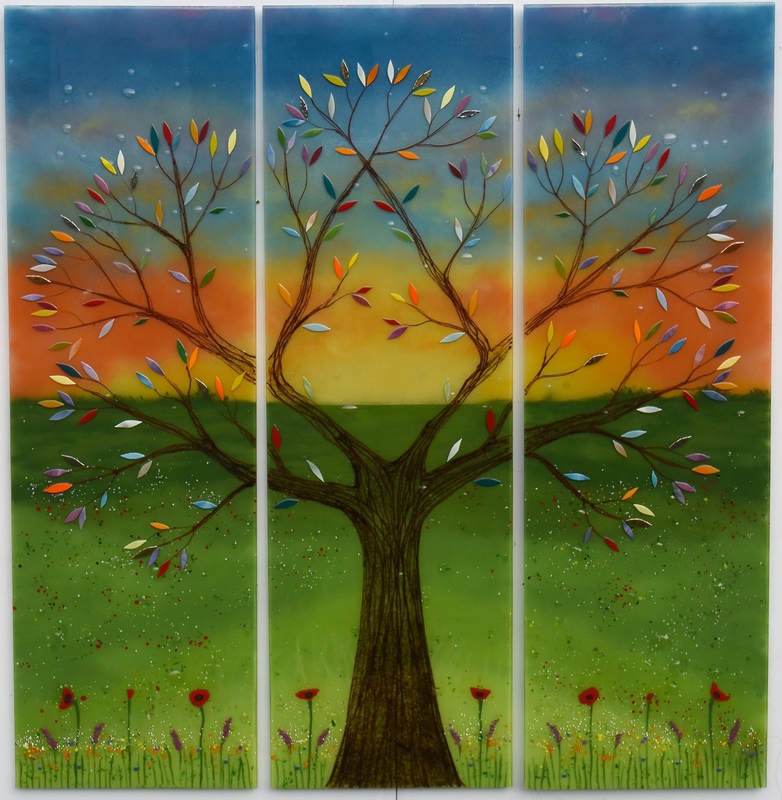 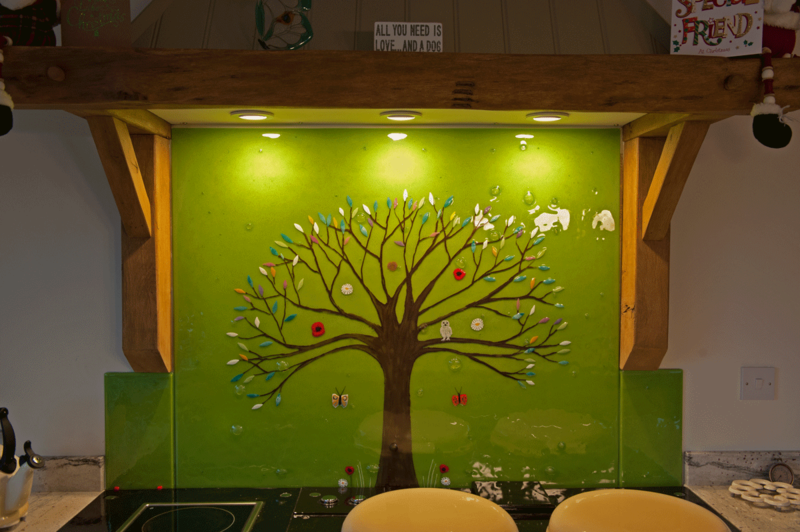 The background of the glass is a sharp olive, forming a vivid base from which the central Tree of Life could sprout. 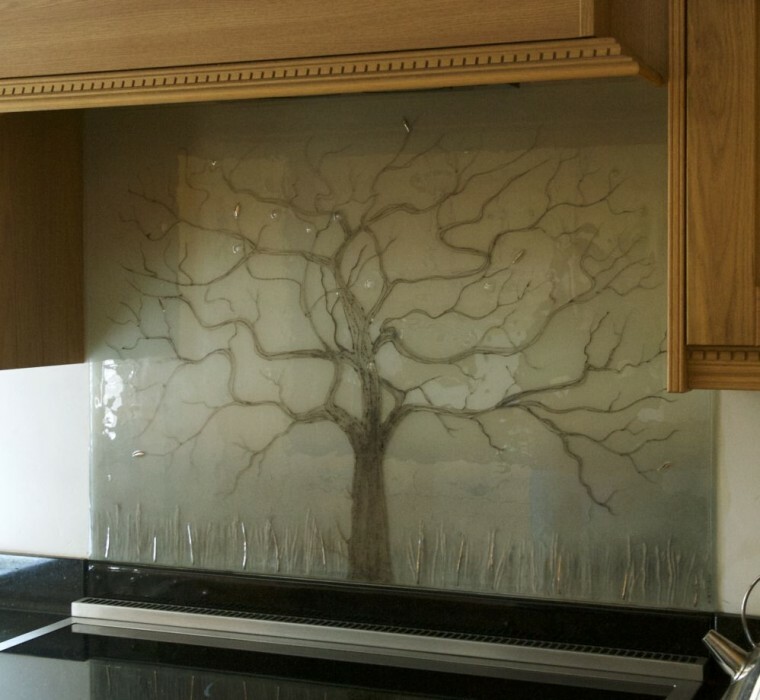 The tree itself is a fantastic sight to behold, created in a diaphanous style by utilising intertwining lines to form the distinctive shape of the trunk so often seen in our work. 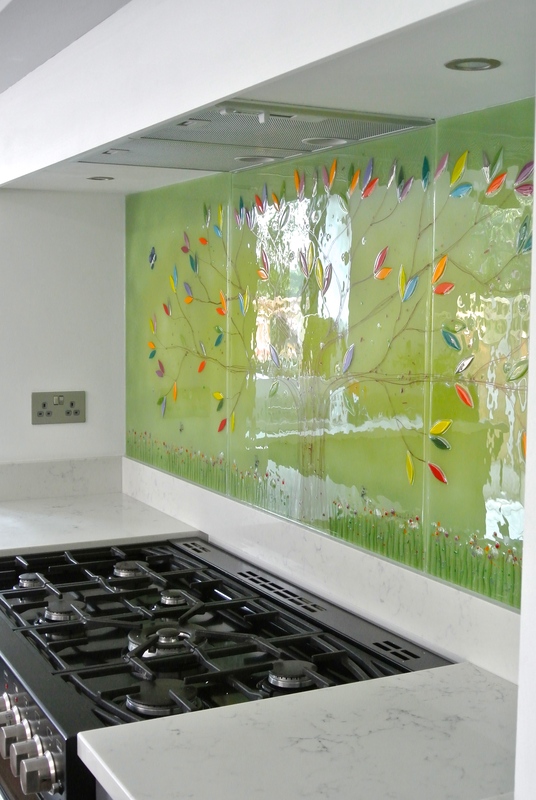 Gorgeous multicoloured leaves show off the brightest colours, alongside butterflies and bees that really add the titular life into the glass. 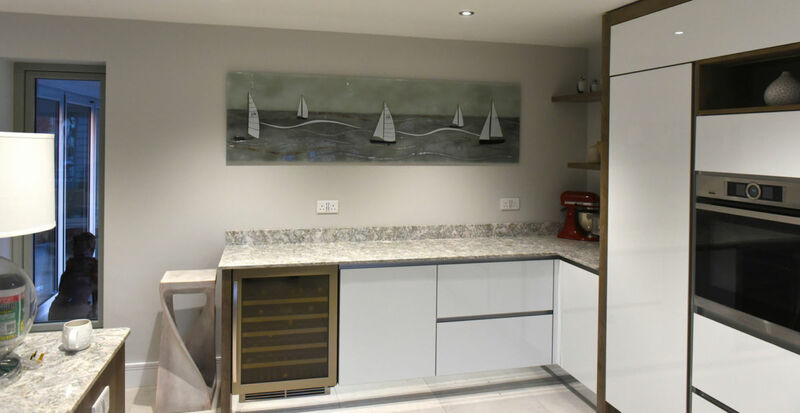 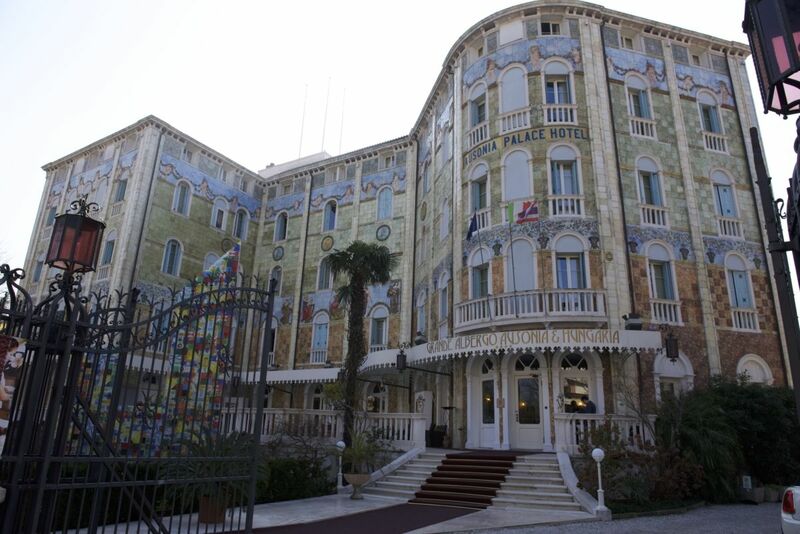 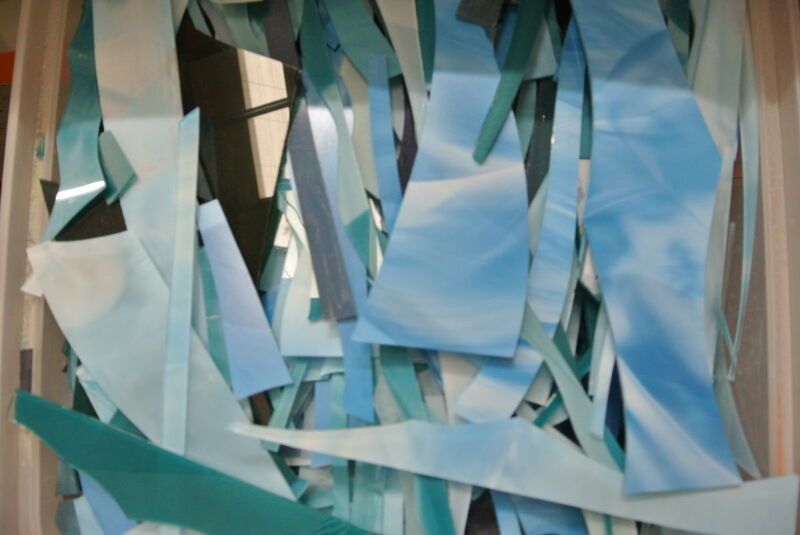 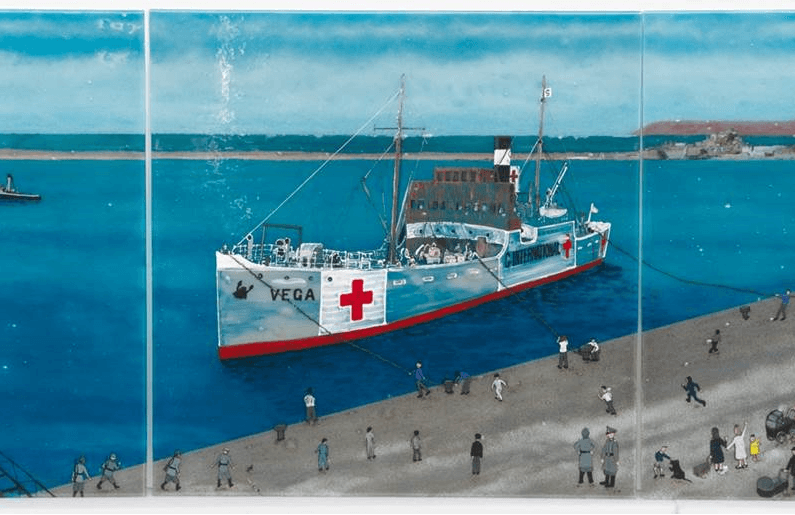 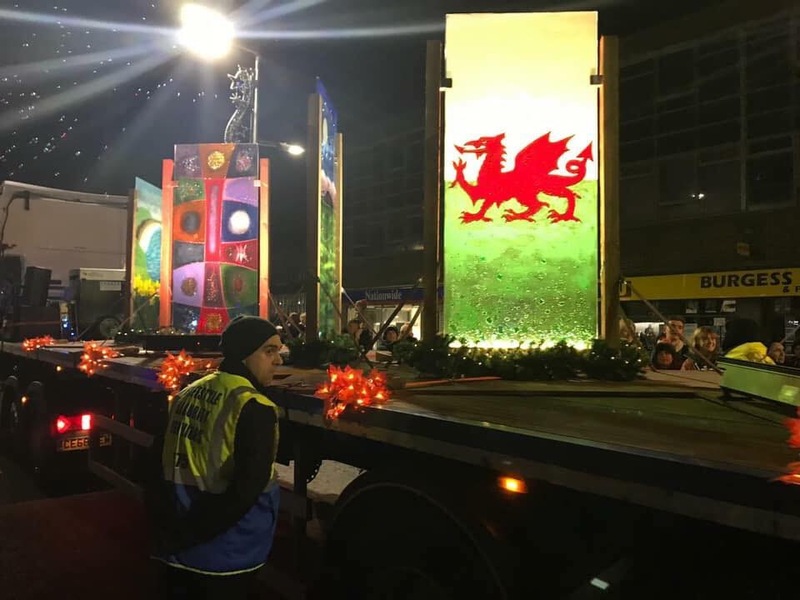 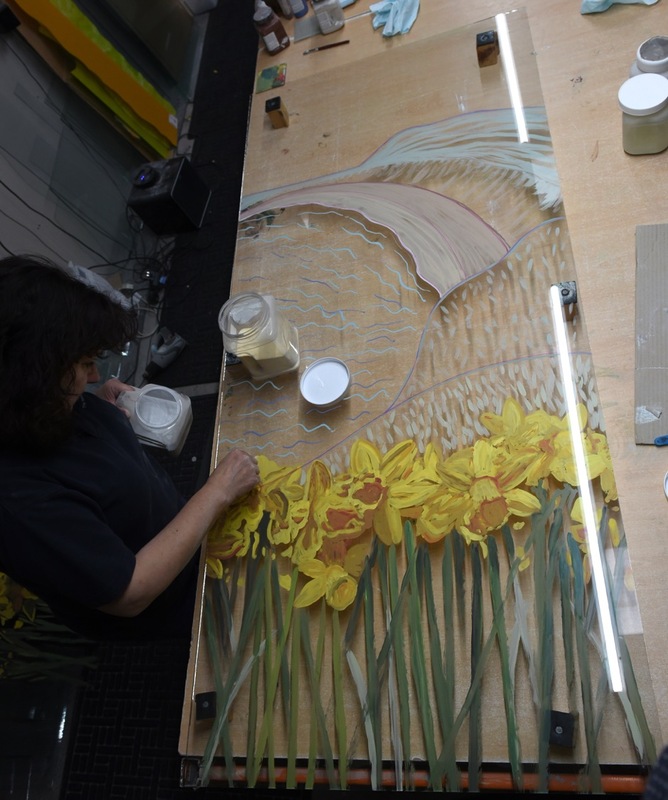 The piece is actually over two metres wide, which is a tremendous amount of space to work with, and there are plenty of details that fill it well. 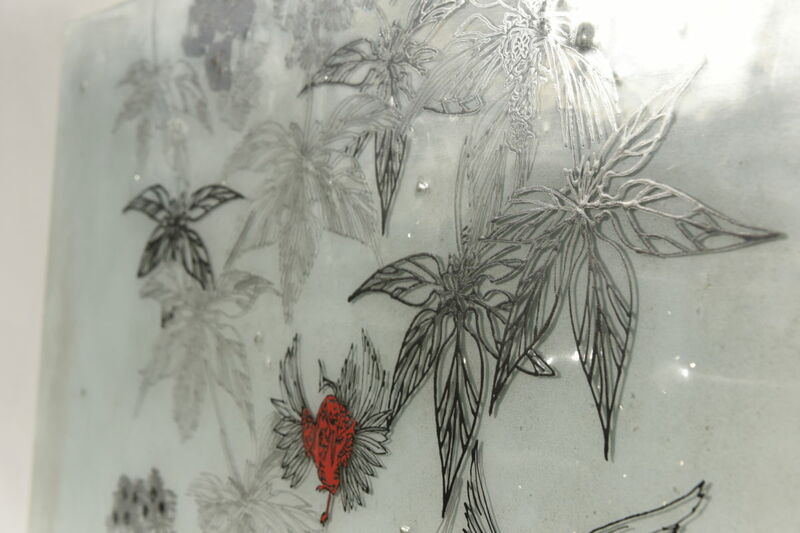 Can you spot the flowers lining the bottom of the glass? 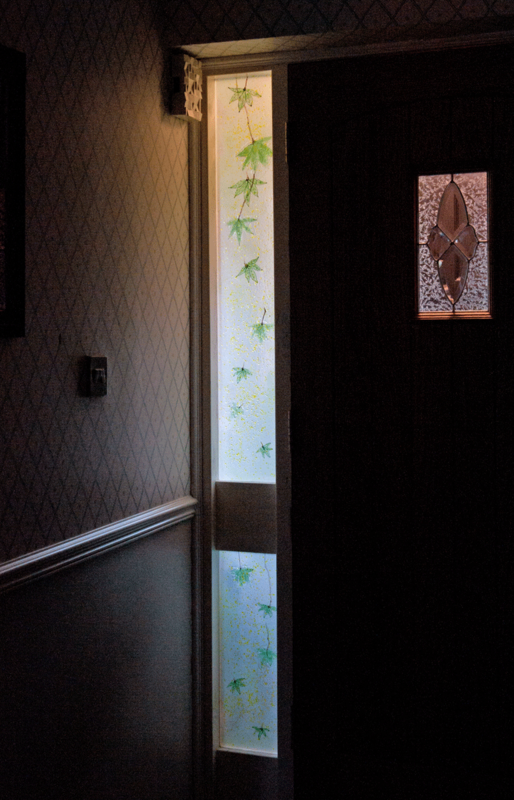 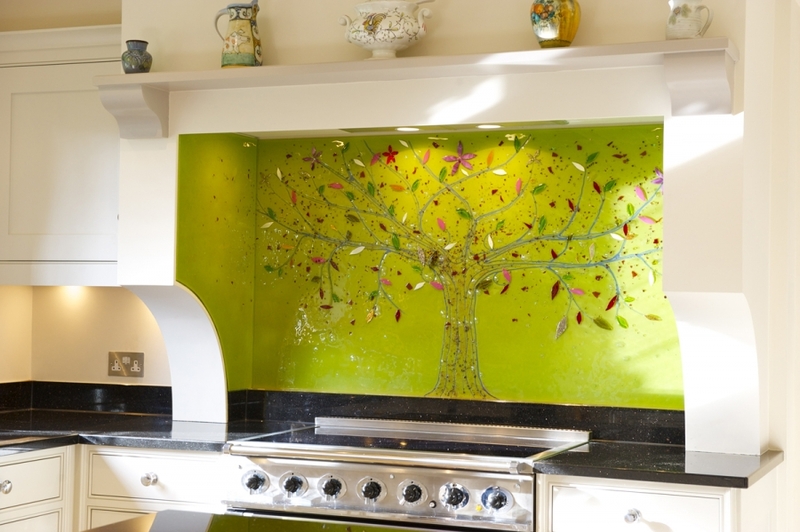 As you can imagine it took a lot of work to bring to life, especially as each leaf on the tree had to be cut by hand, but seeing how amazing it looked in situ definitely made it all worthwhile. 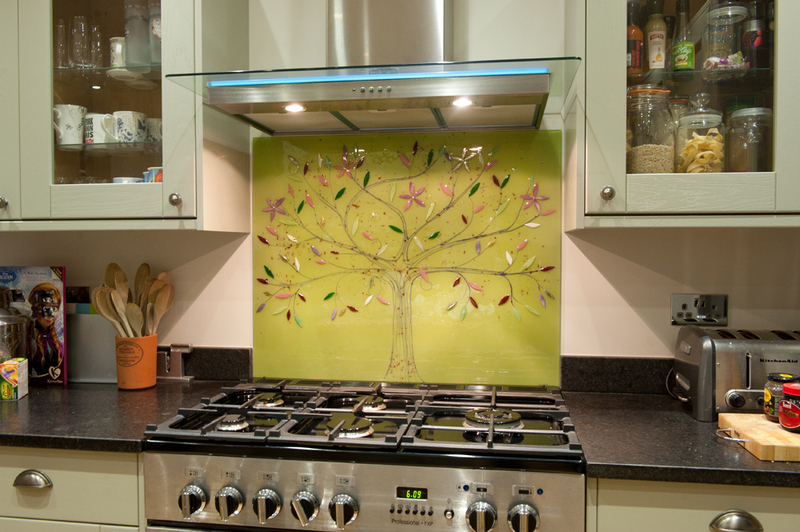 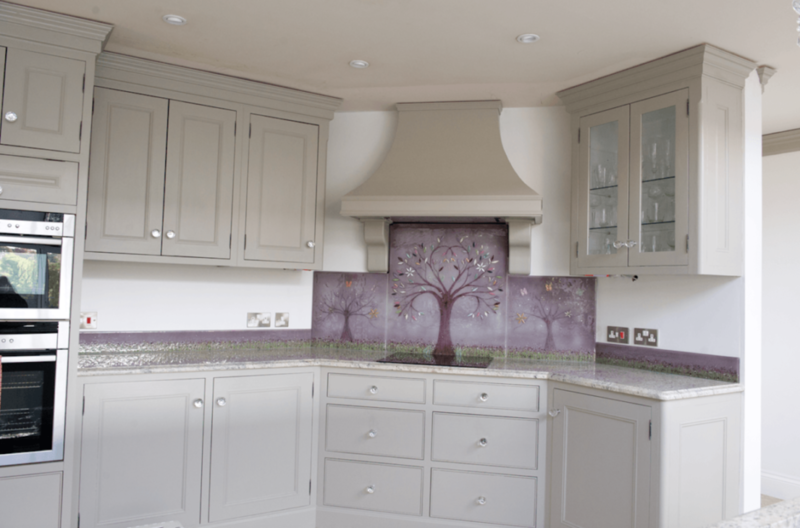 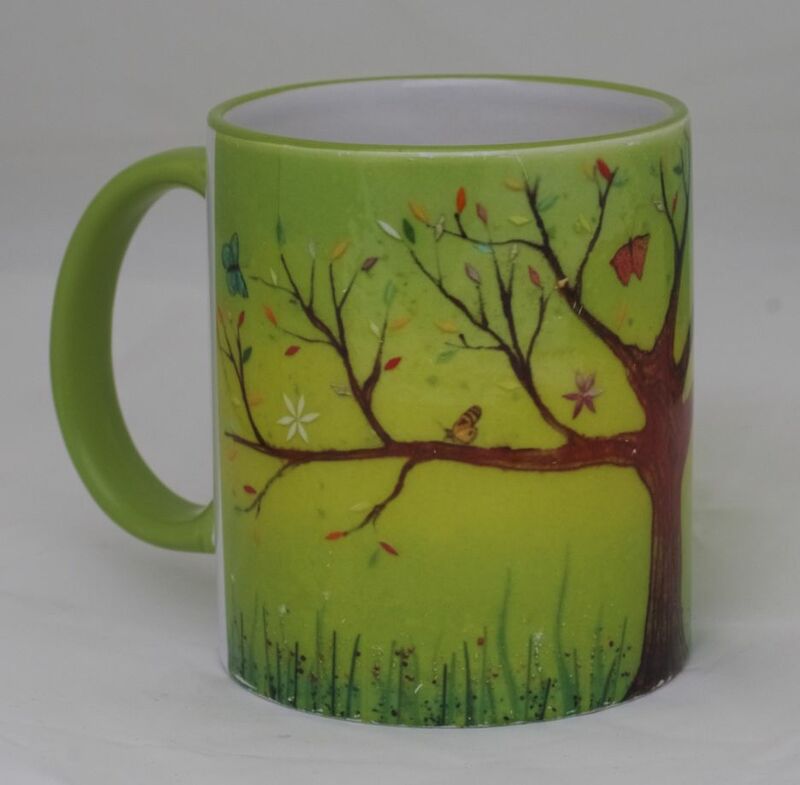 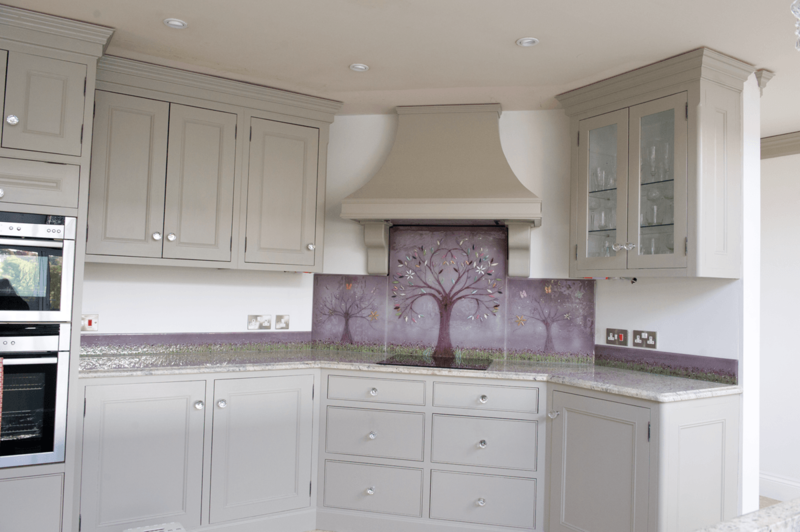 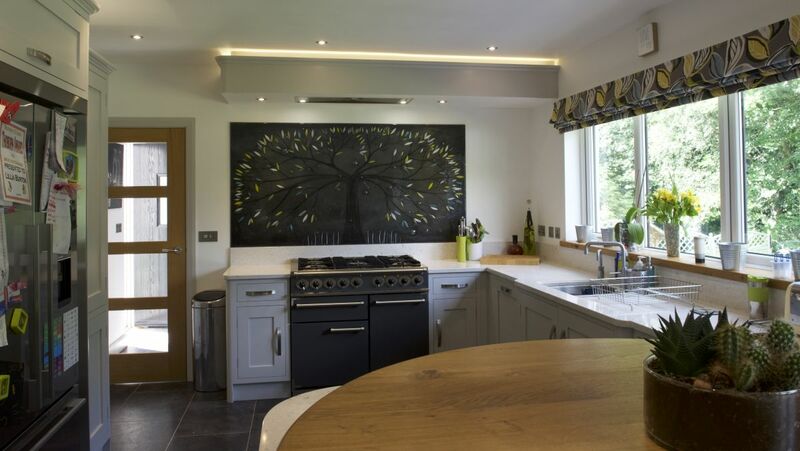 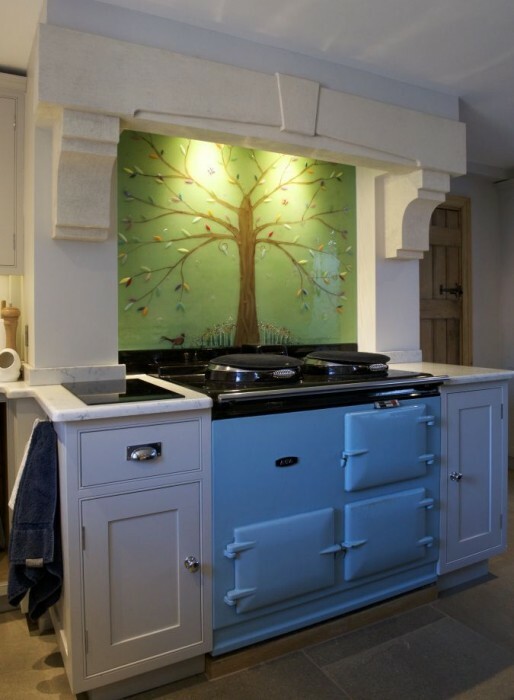 The Tree of Life turned out to be the perfect fit for the traditional styling of the kitchen, though we imagine that it would look every bit as fantastic in any kitchen. 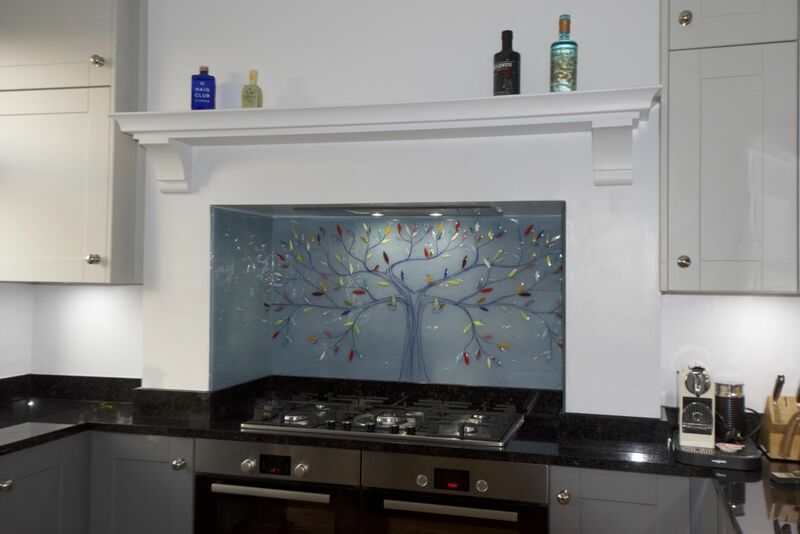 It’s a timeless design, after all, and the bespoke nature of our glass splashbacks makes it an infinitely changeable one, too. 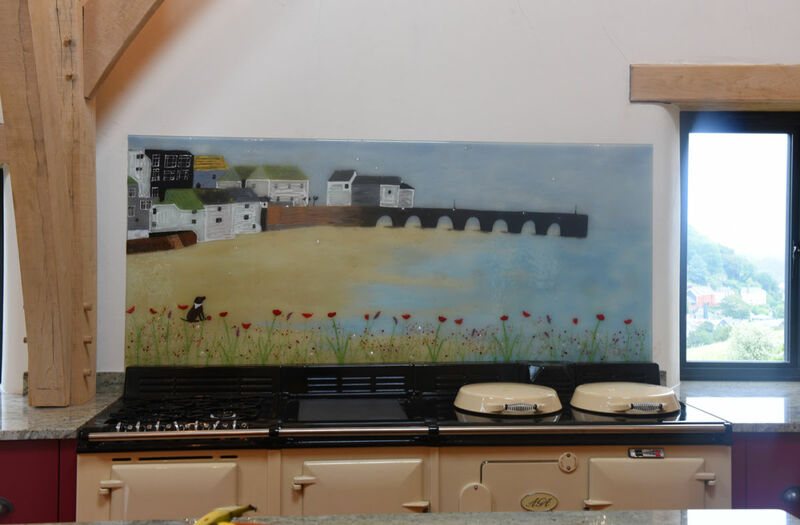 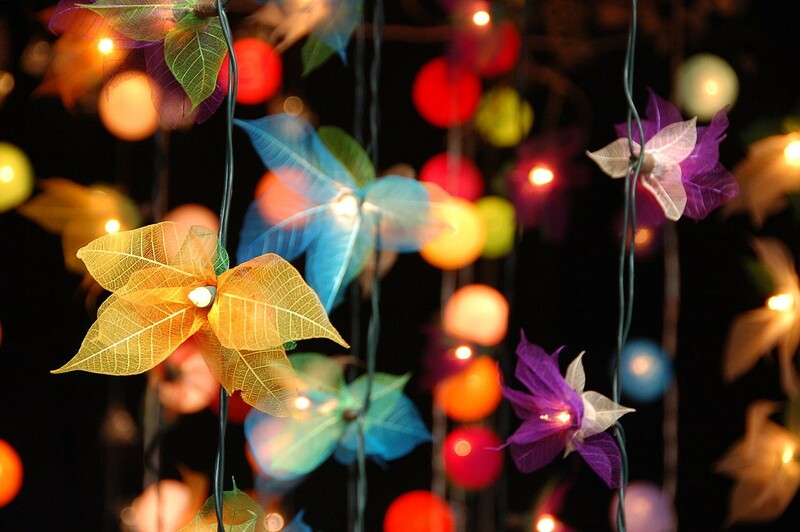 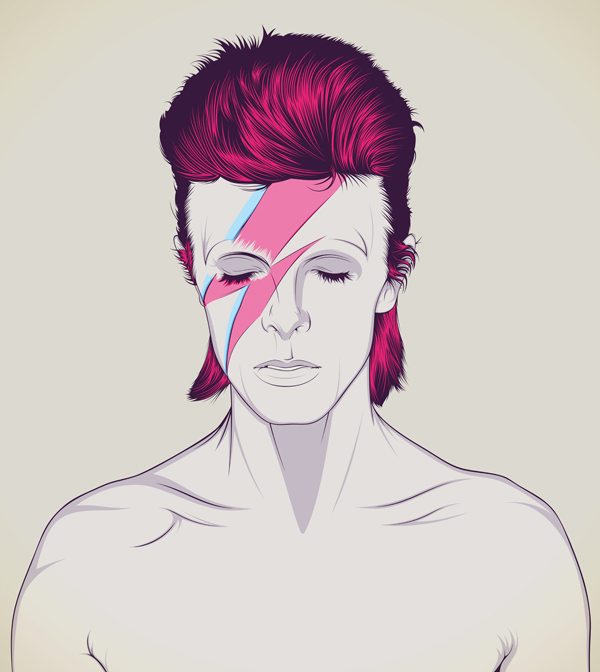 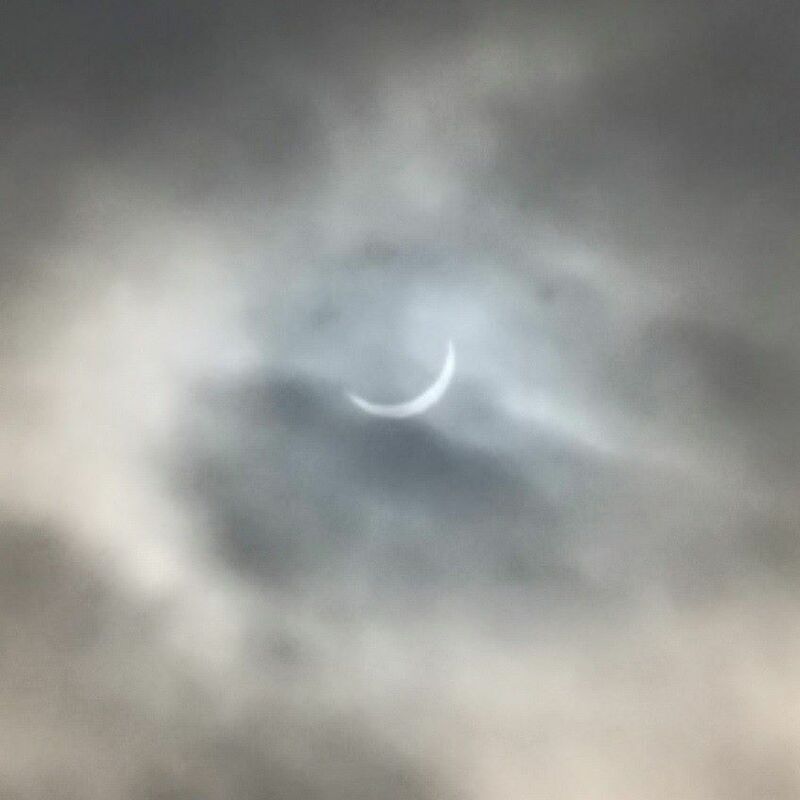 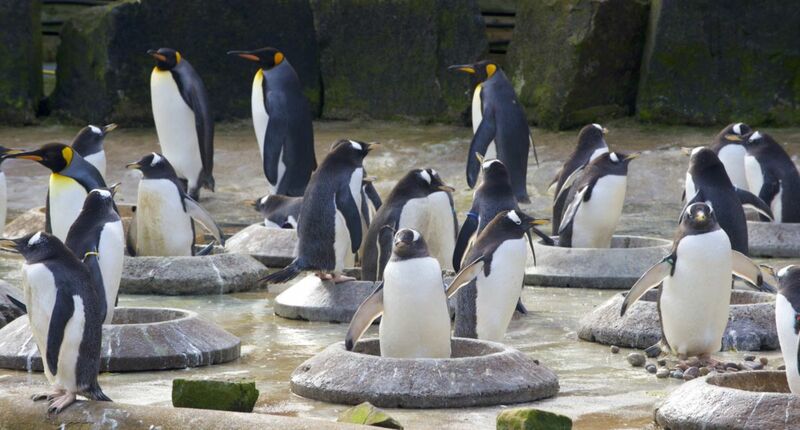 If you’ve got an idea for where your very own version of it could go – let us know! 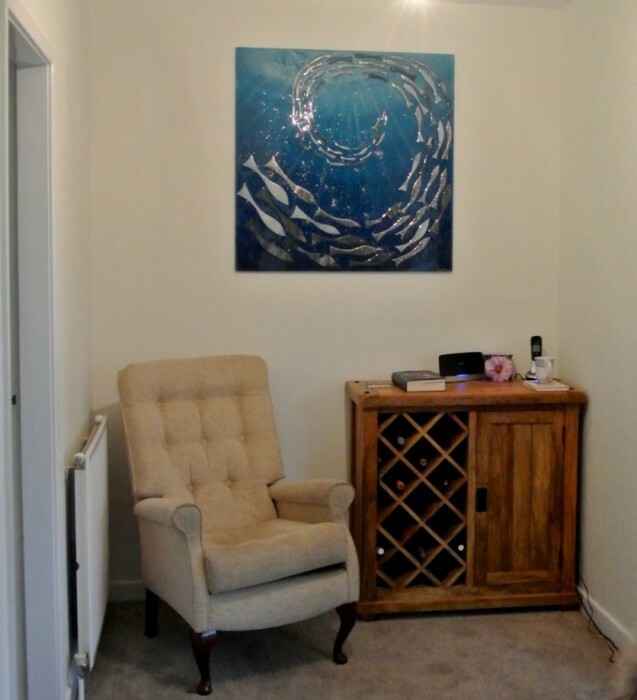 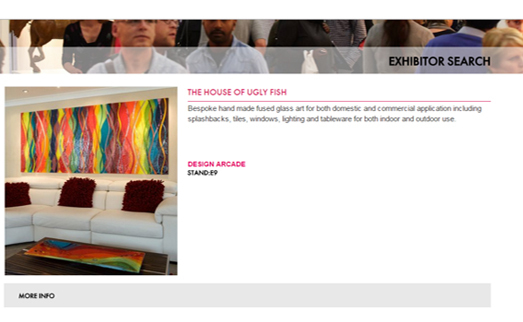 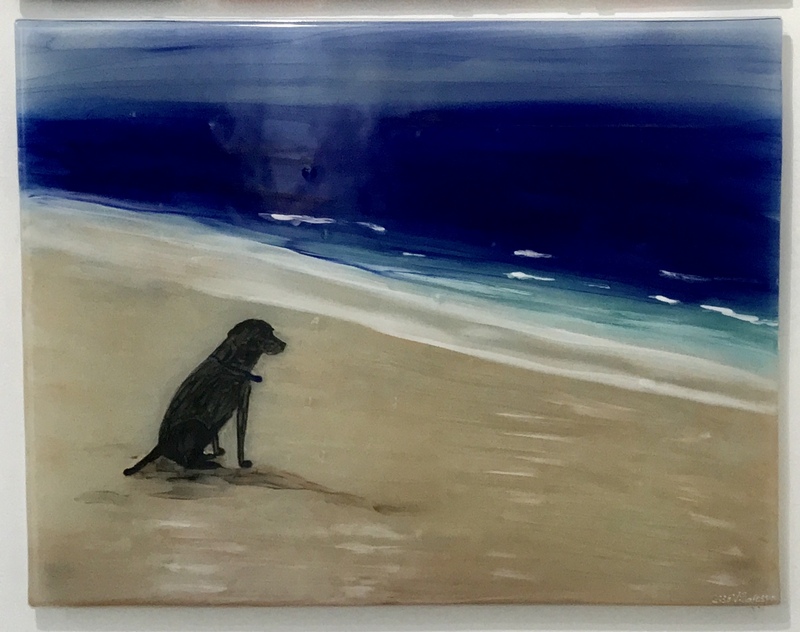 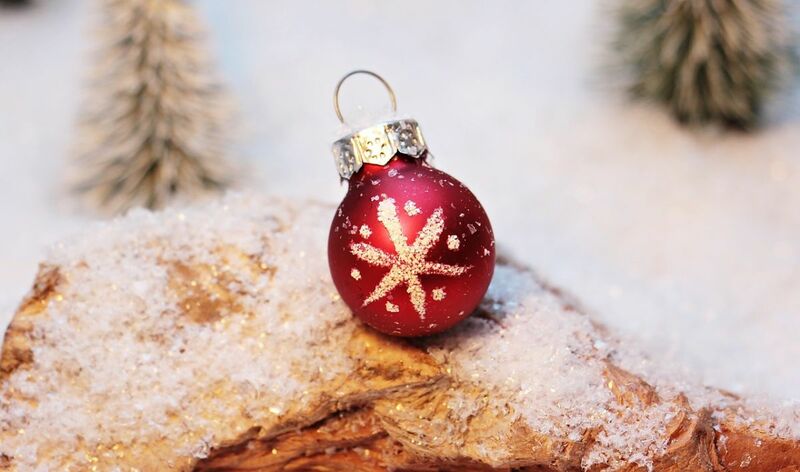 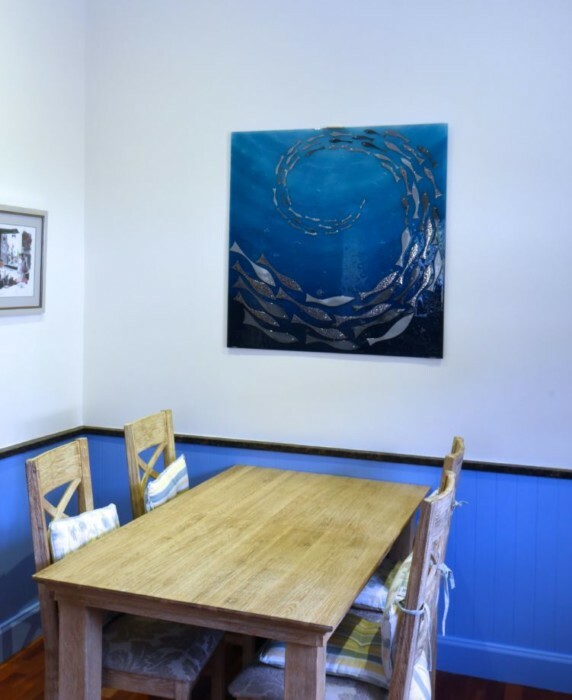 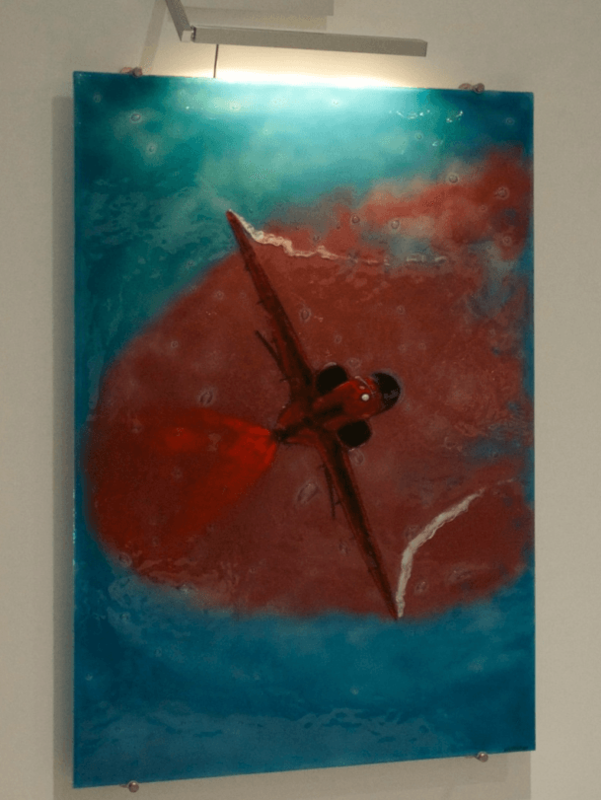 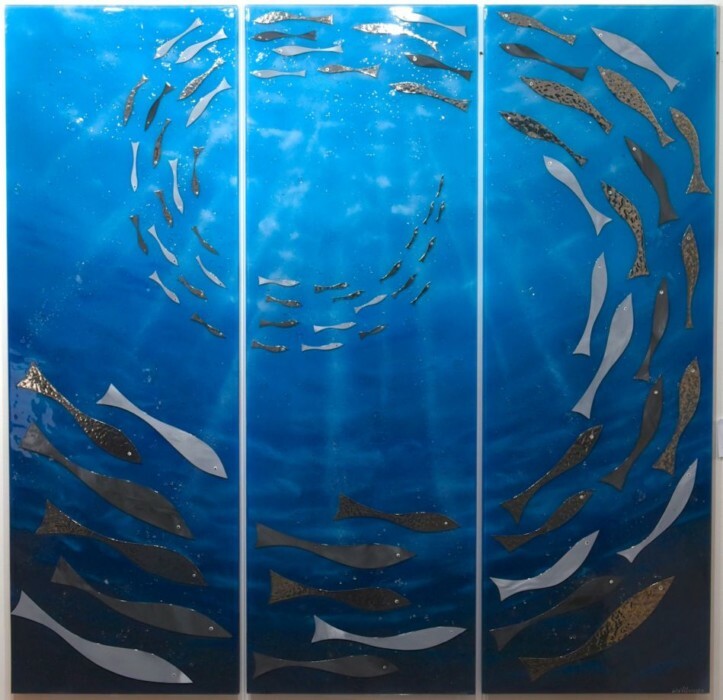 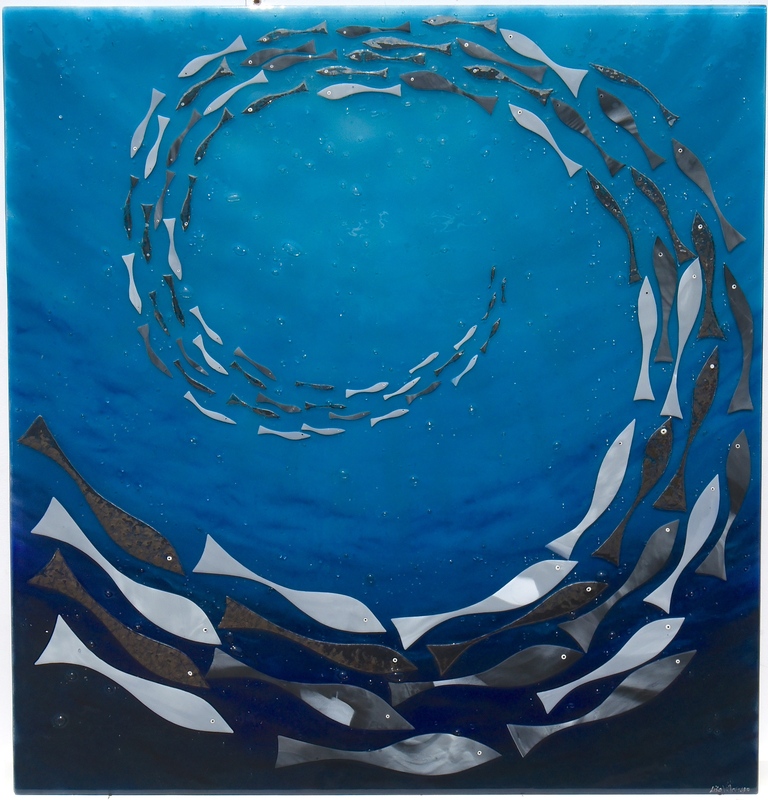 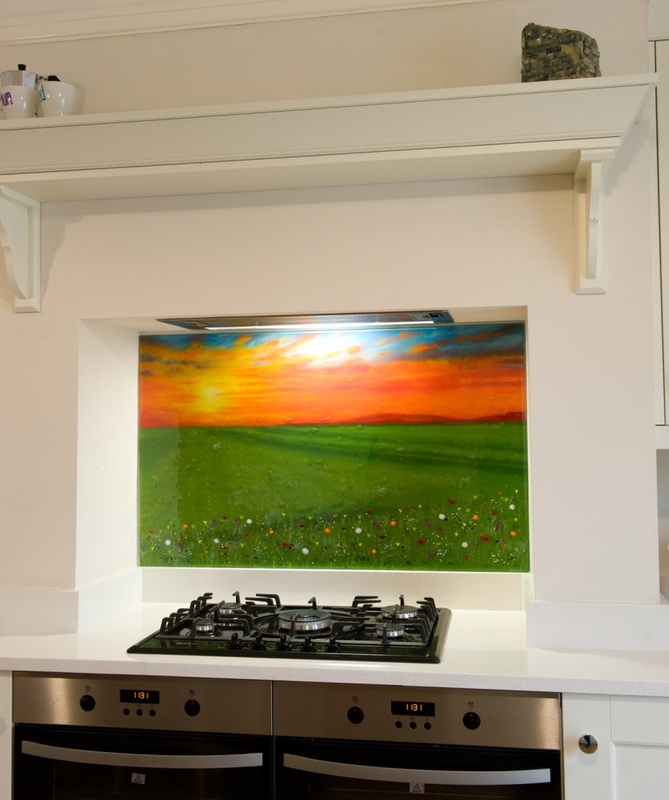 We here at The House of Ugly Fish love nothing more than bringing gorgeous fused glass art to life, so make sure you get in touch if you’d love to bring a piece or two into your home. 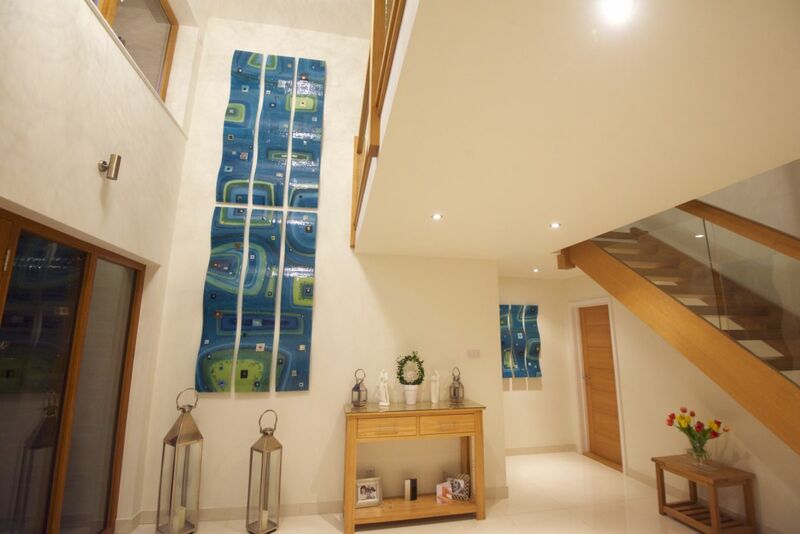 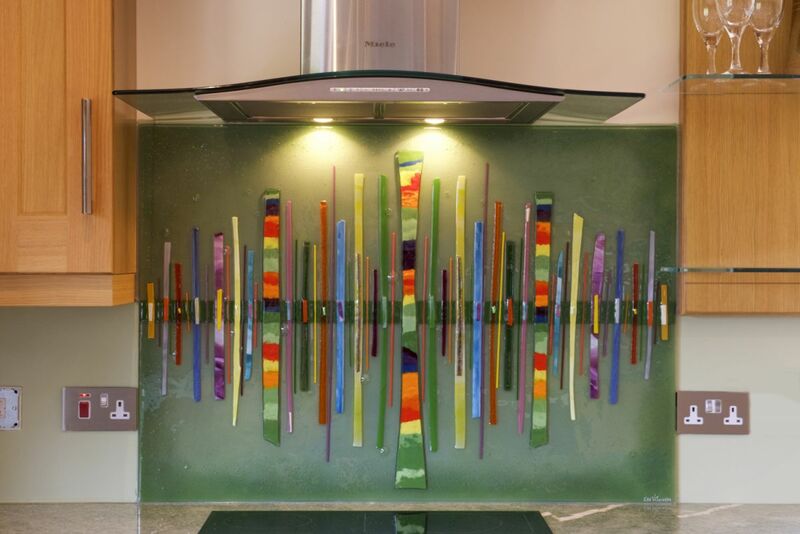 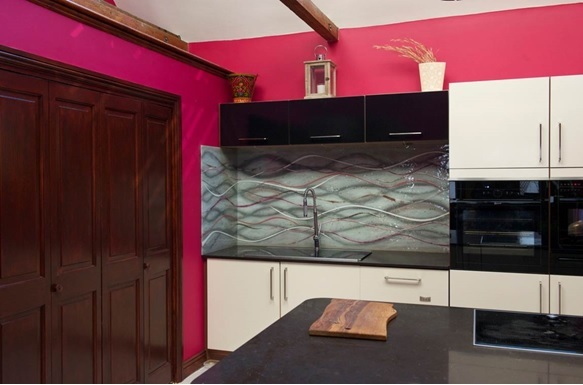 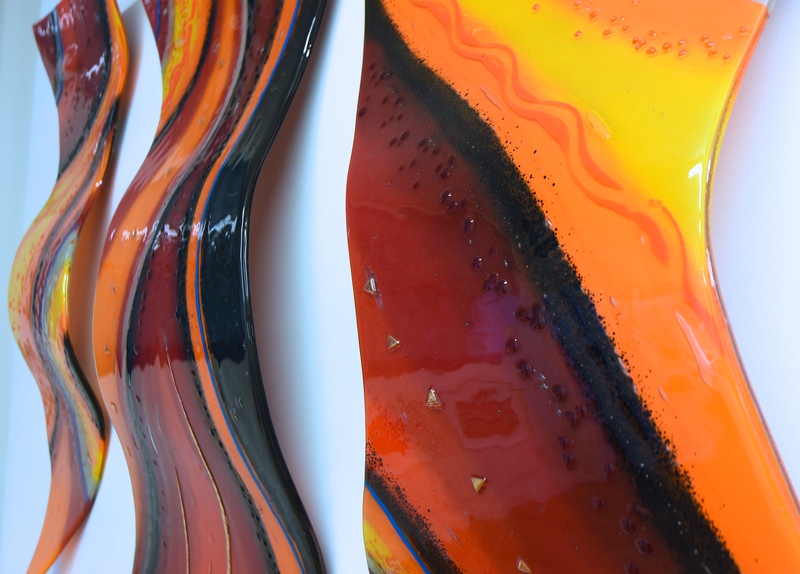 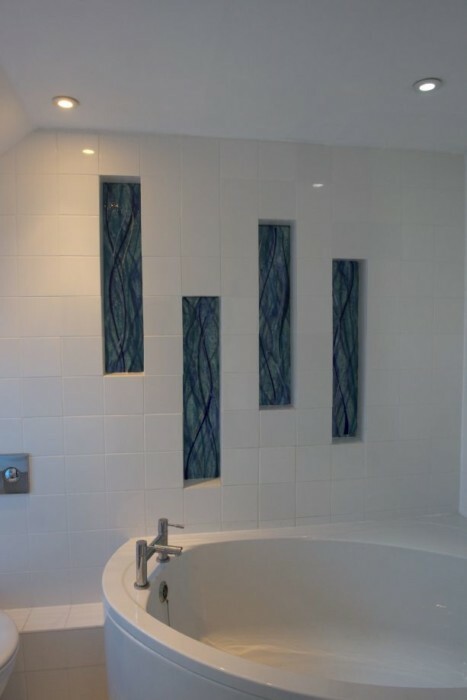 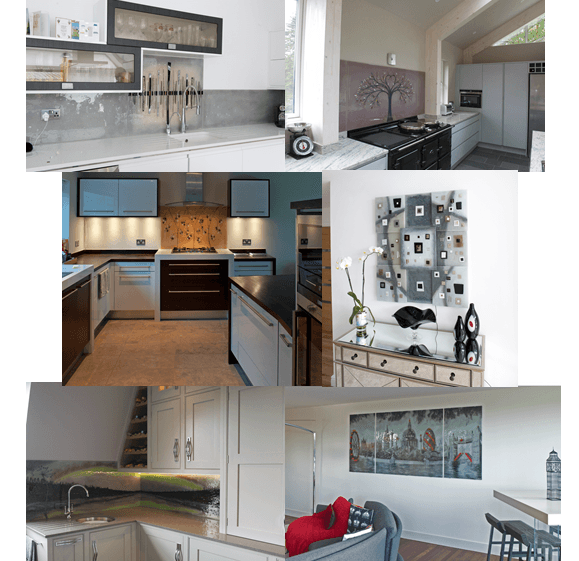 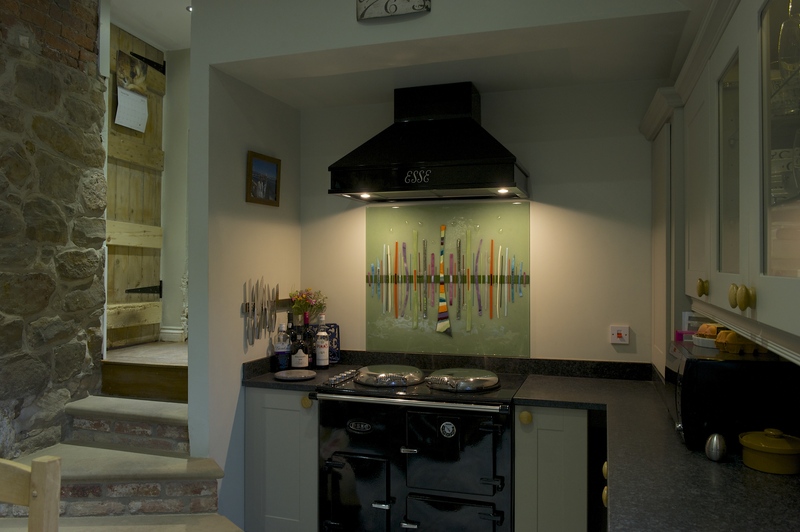 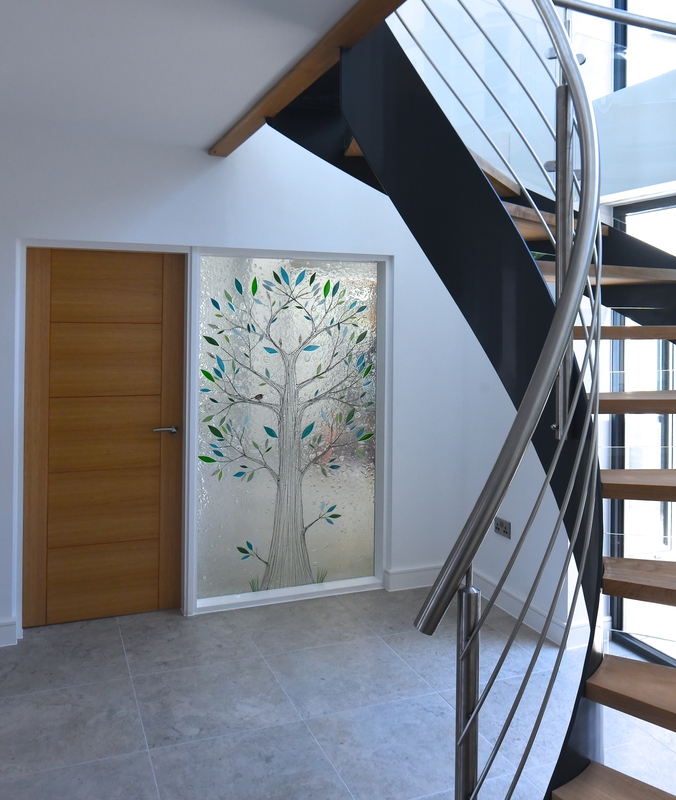 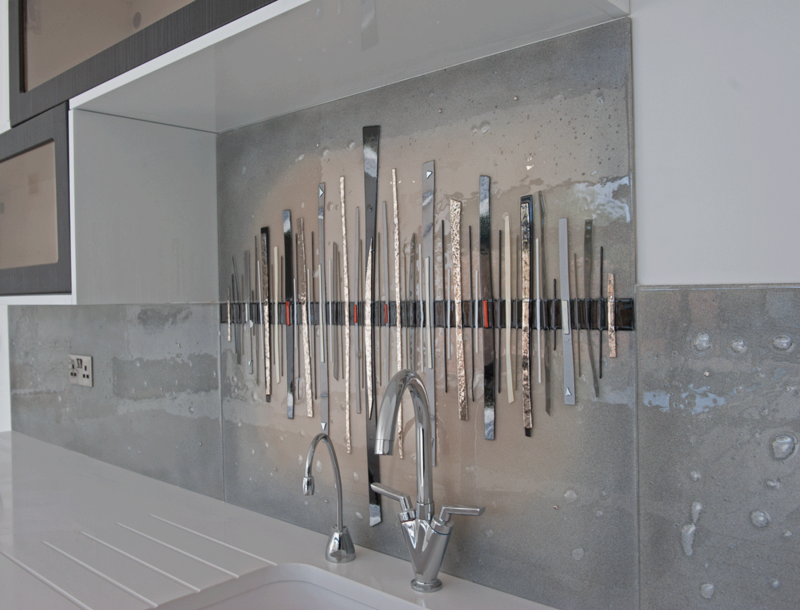 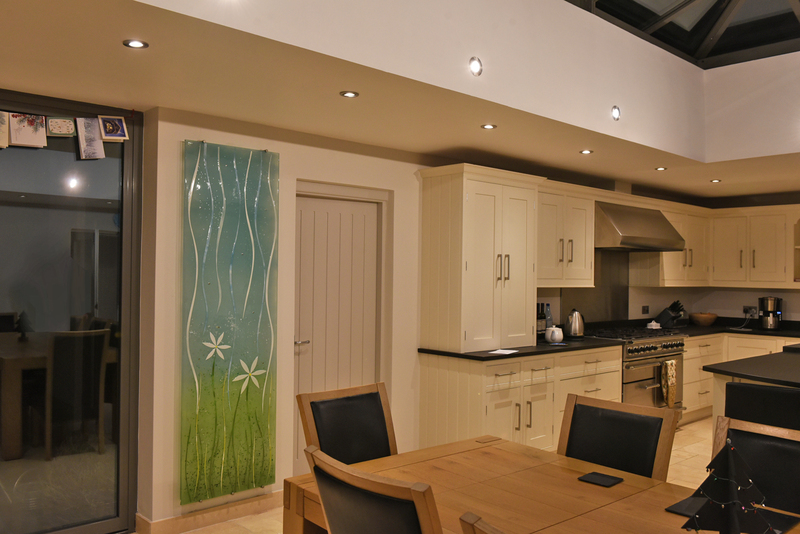 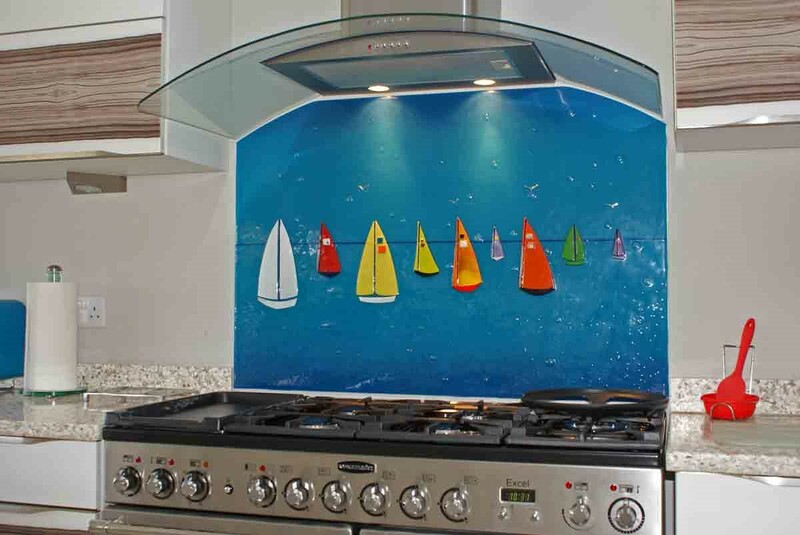 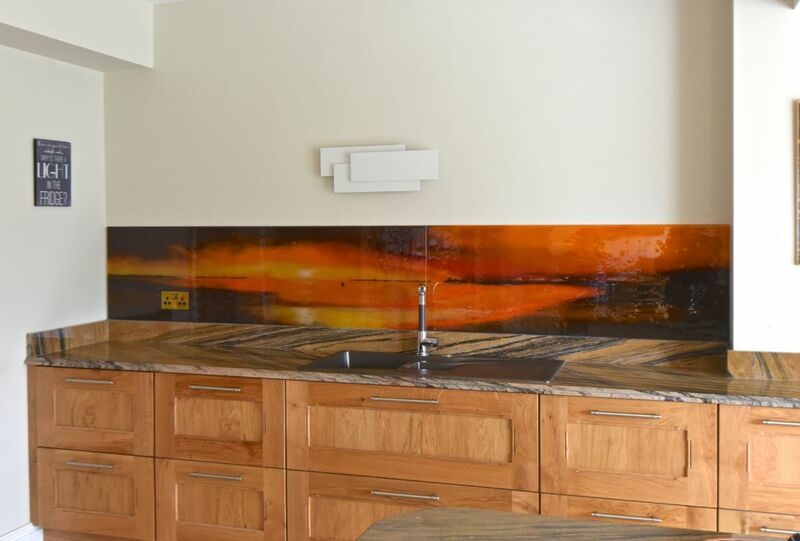 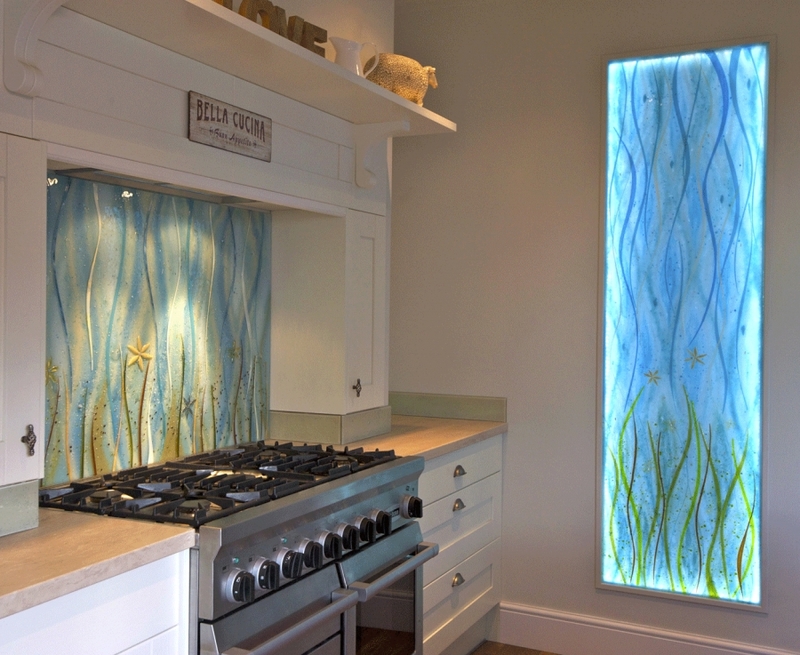 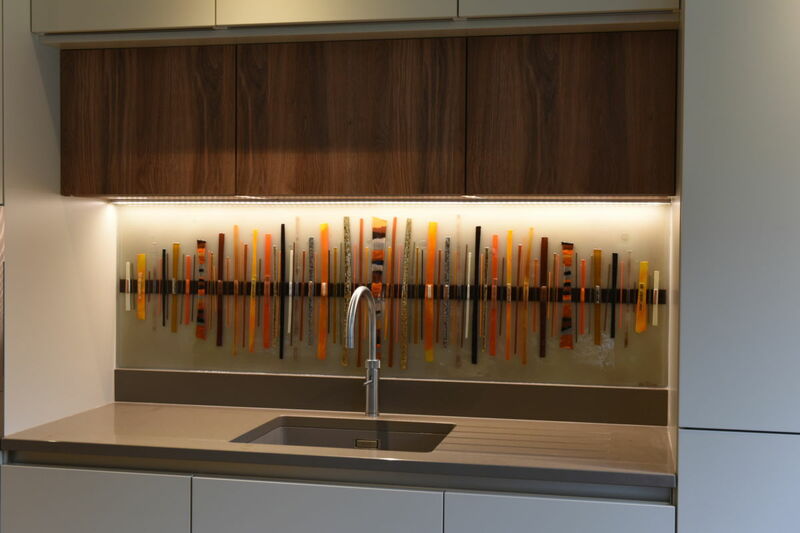 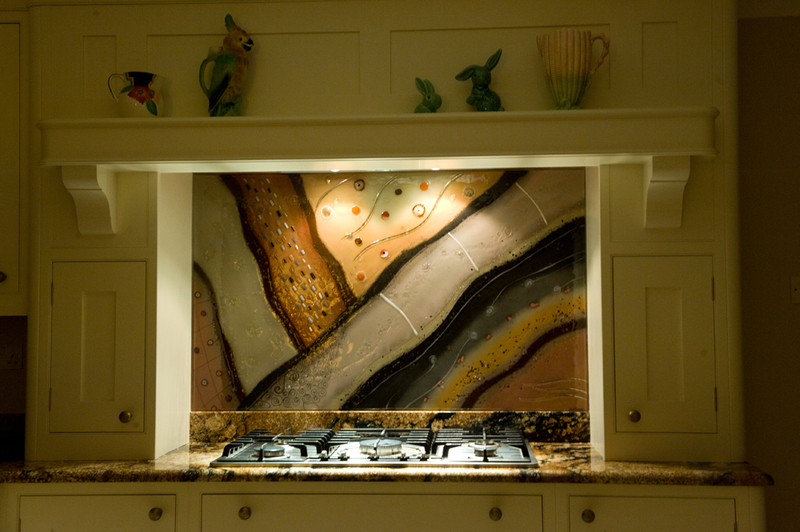 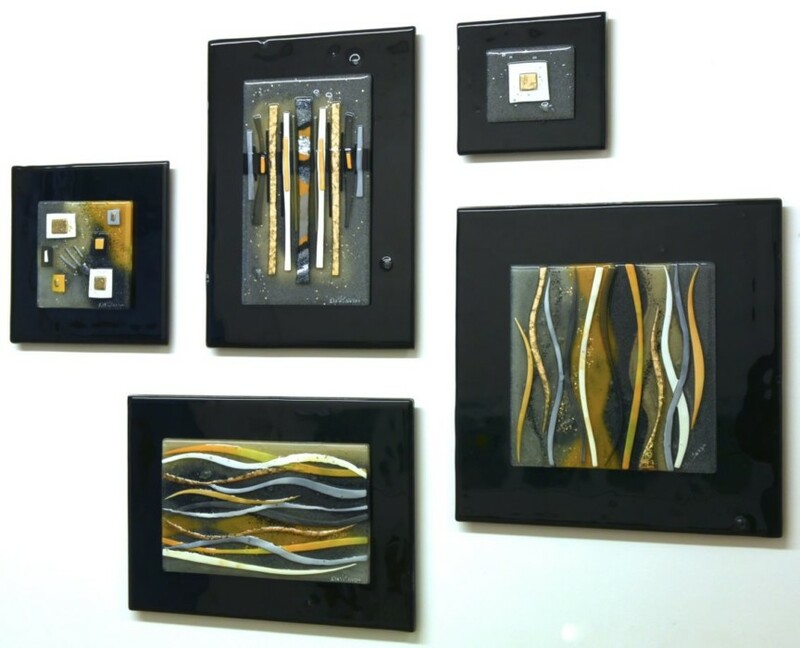 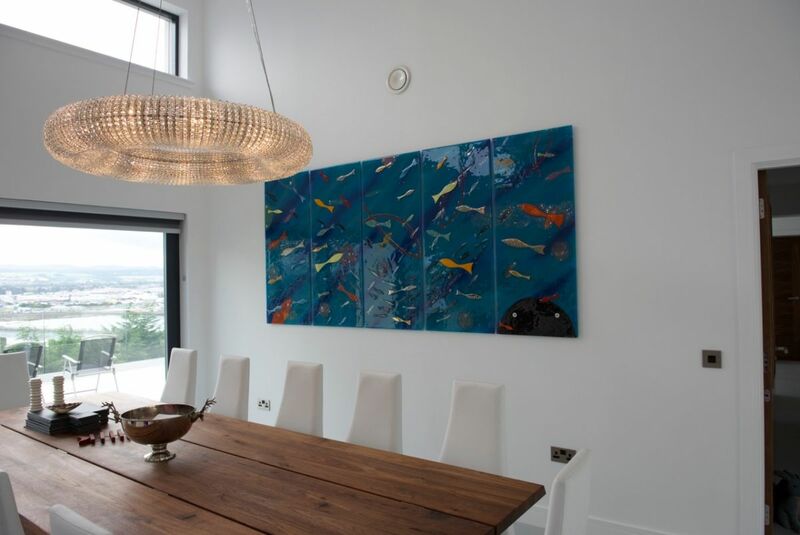 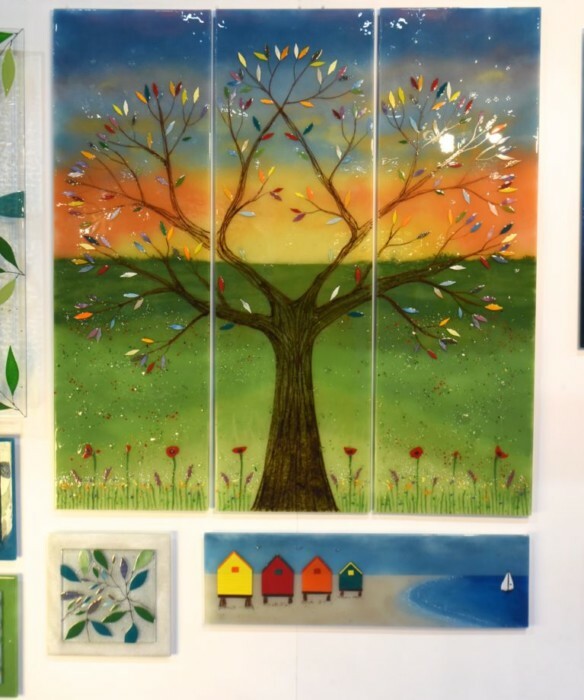 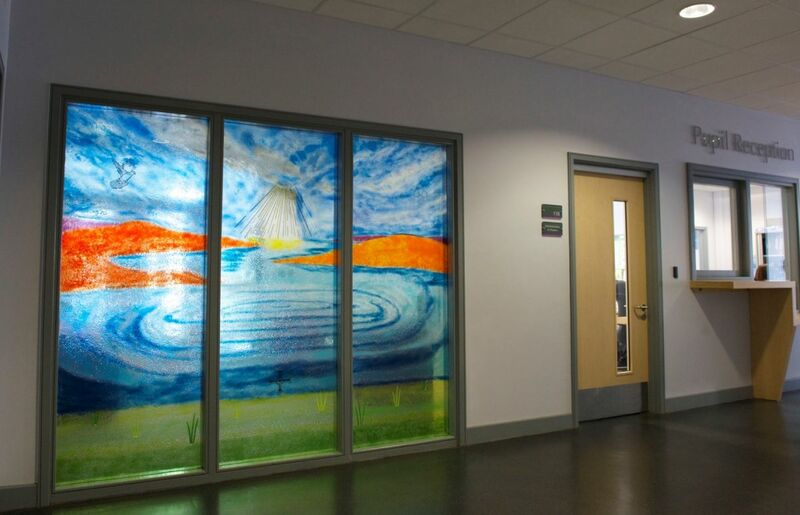 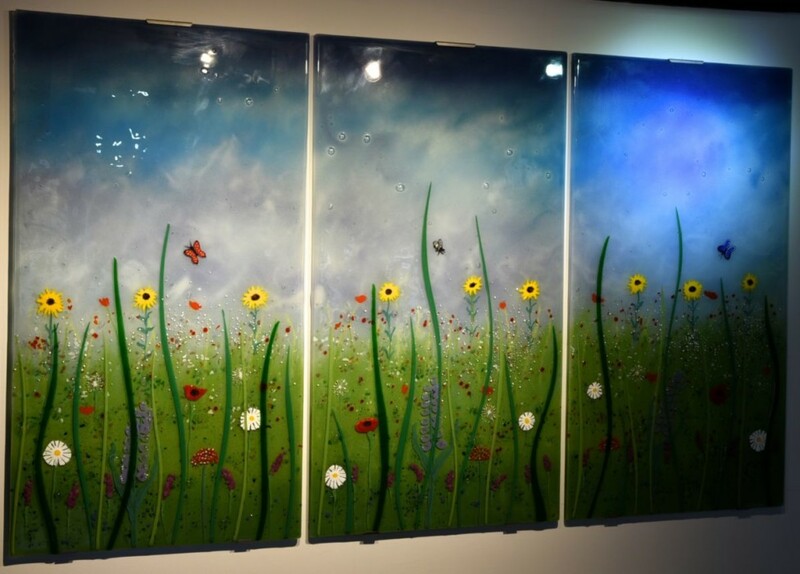 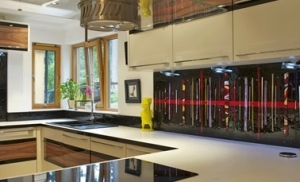 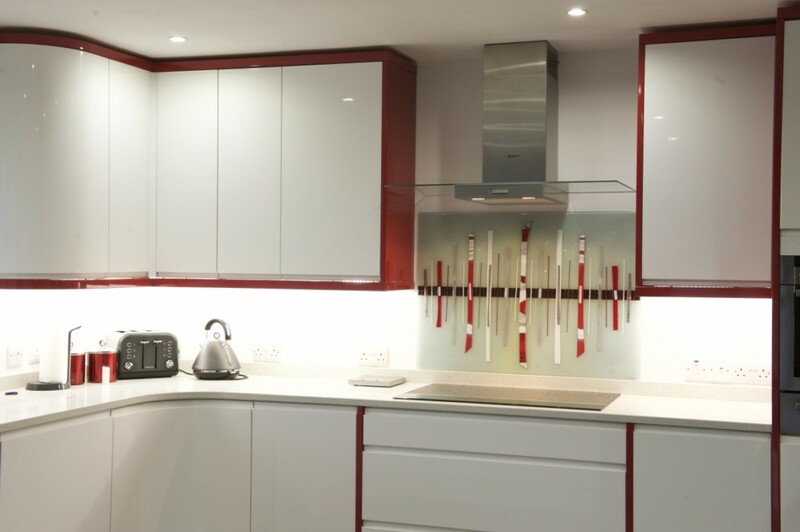 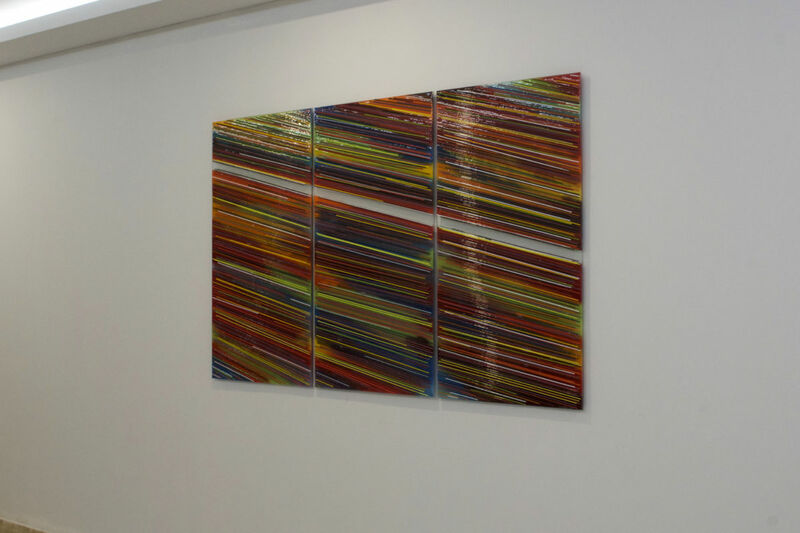 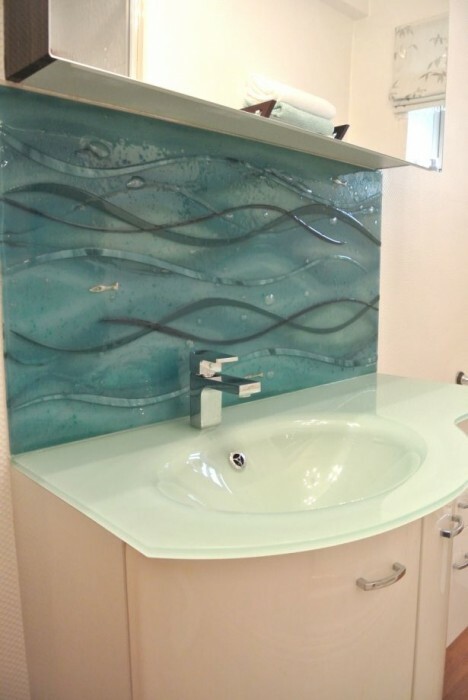 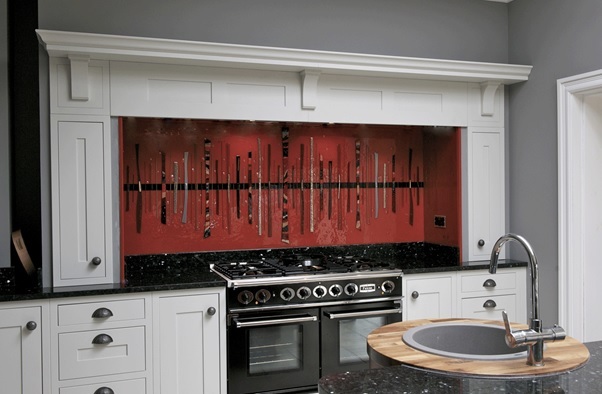 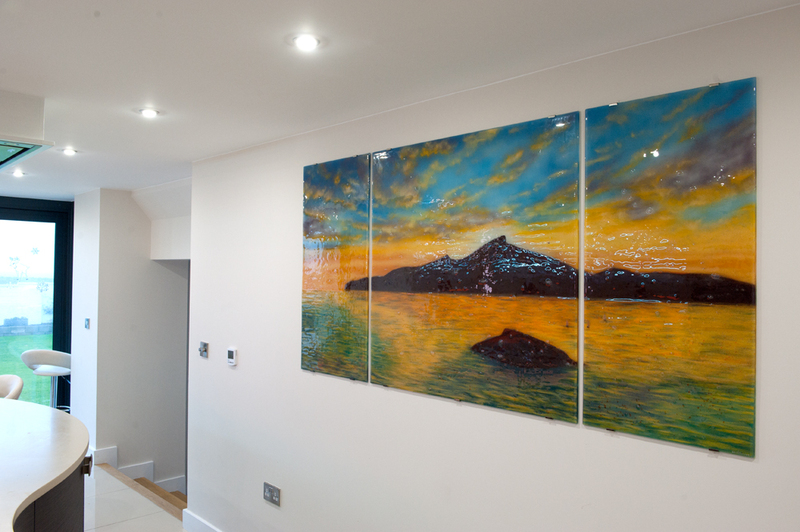 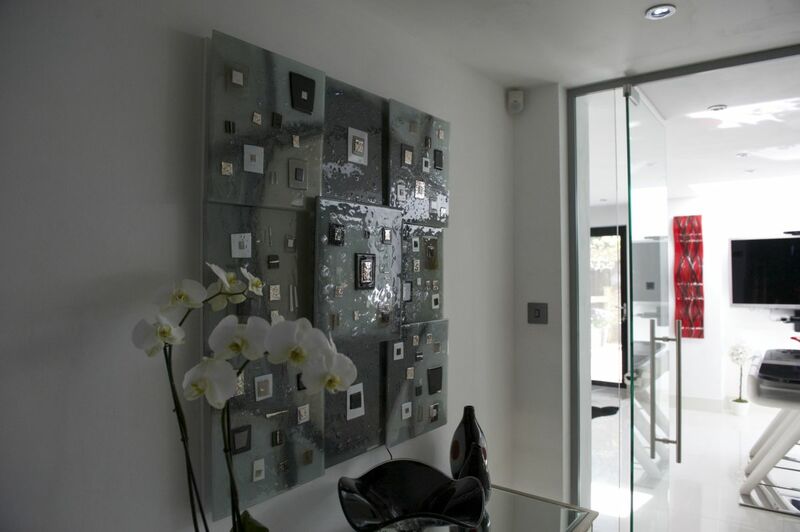 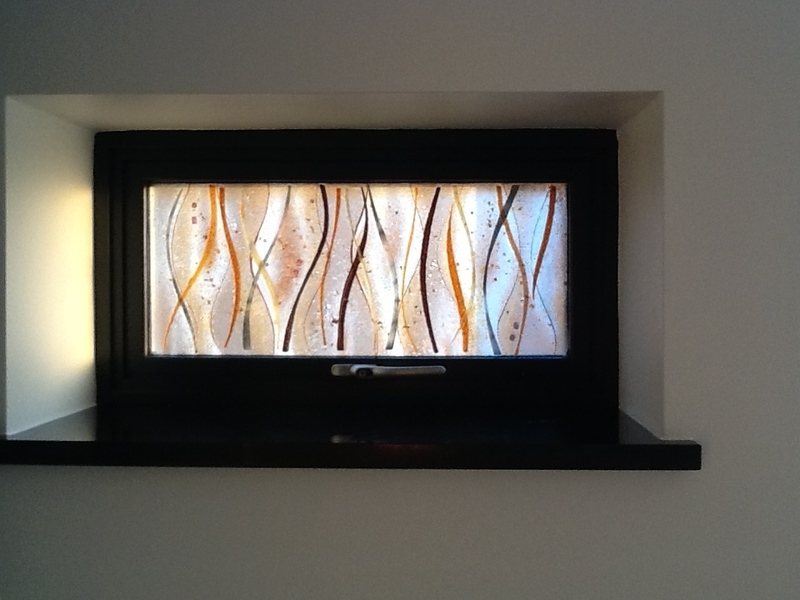 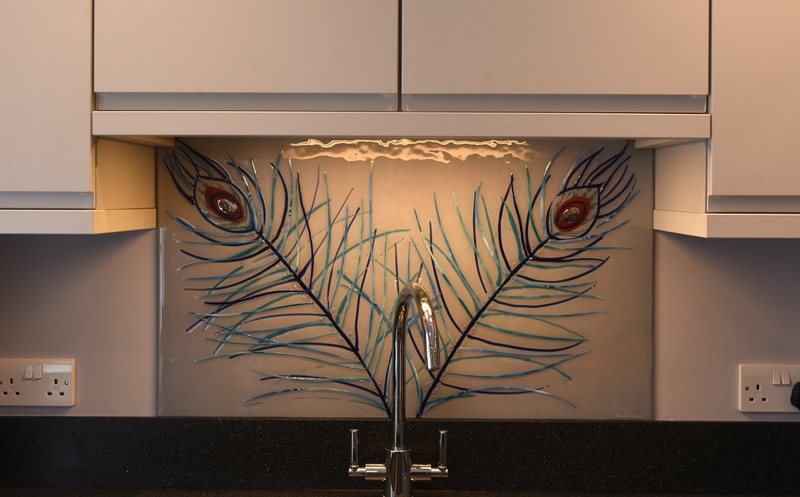 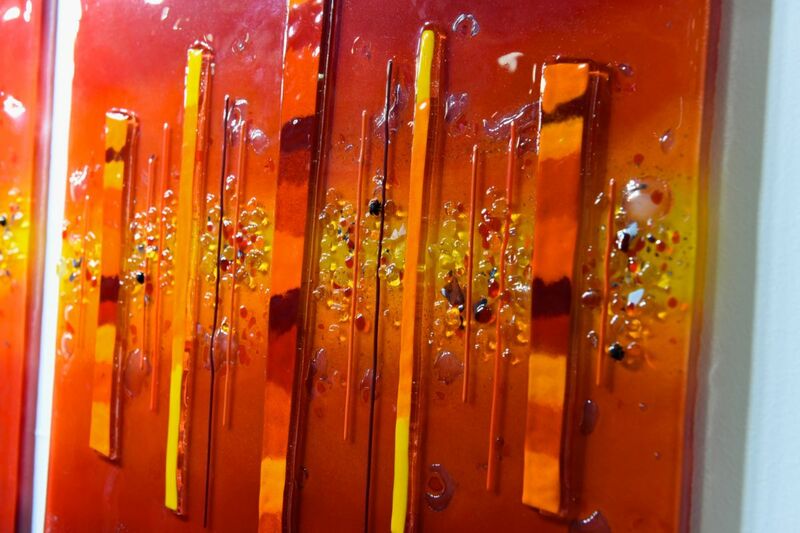 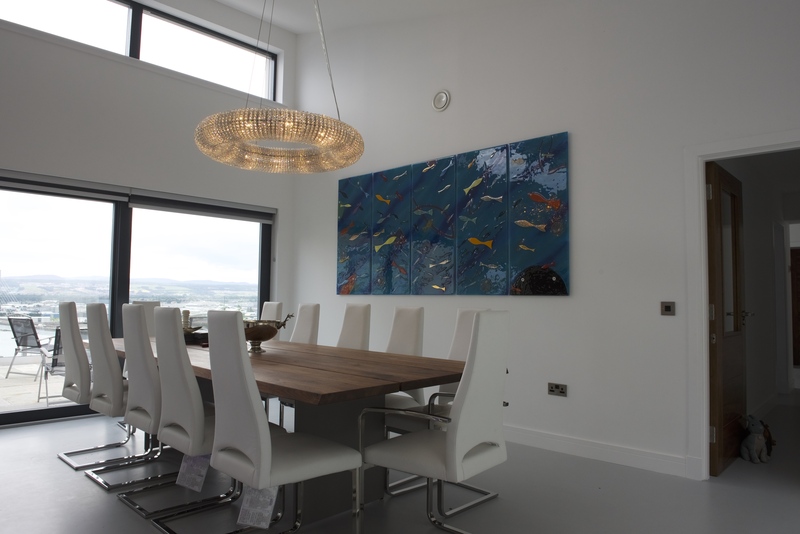 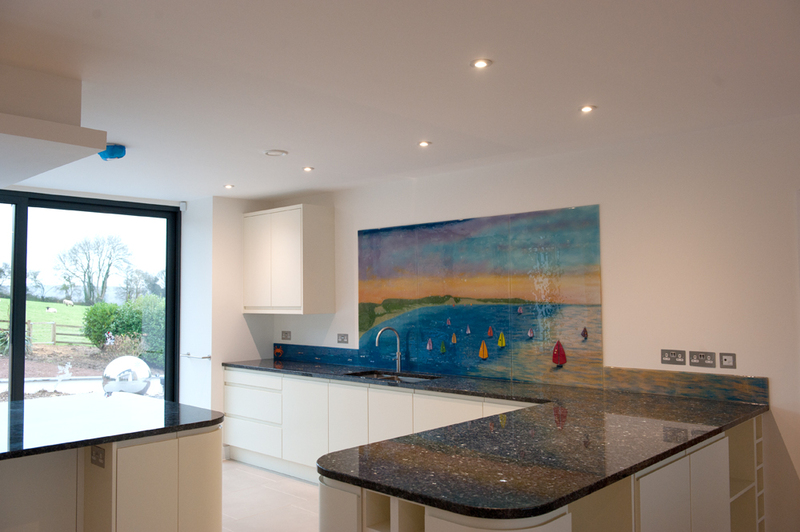 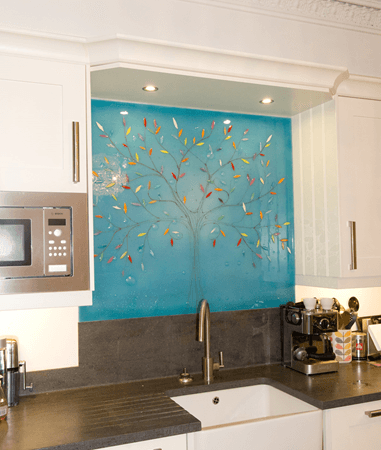 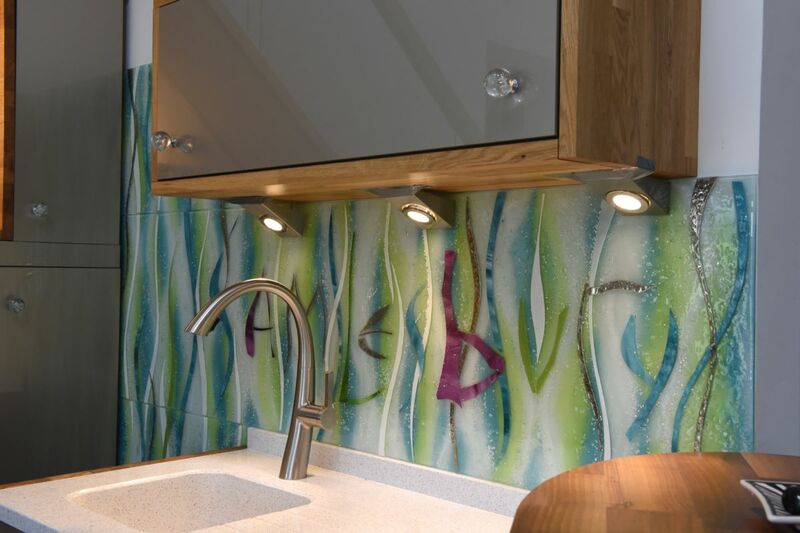 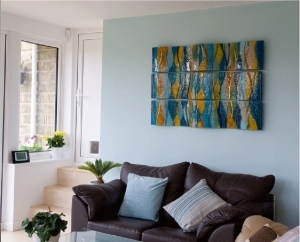 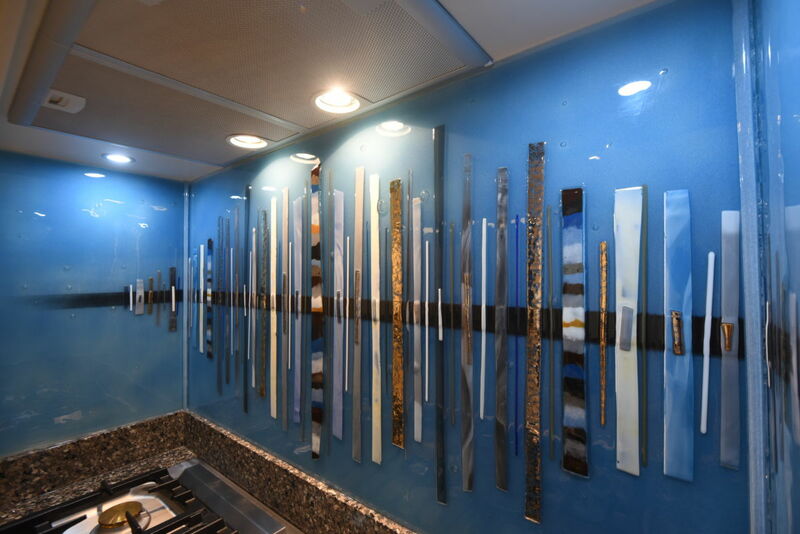 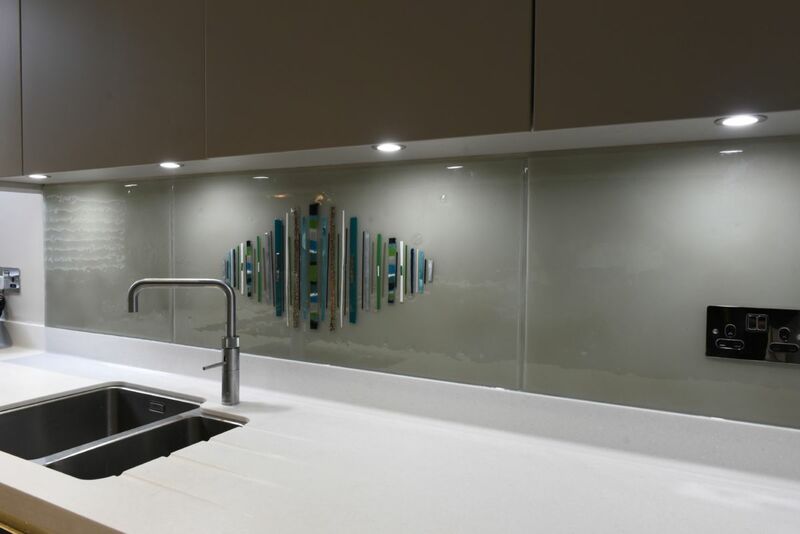 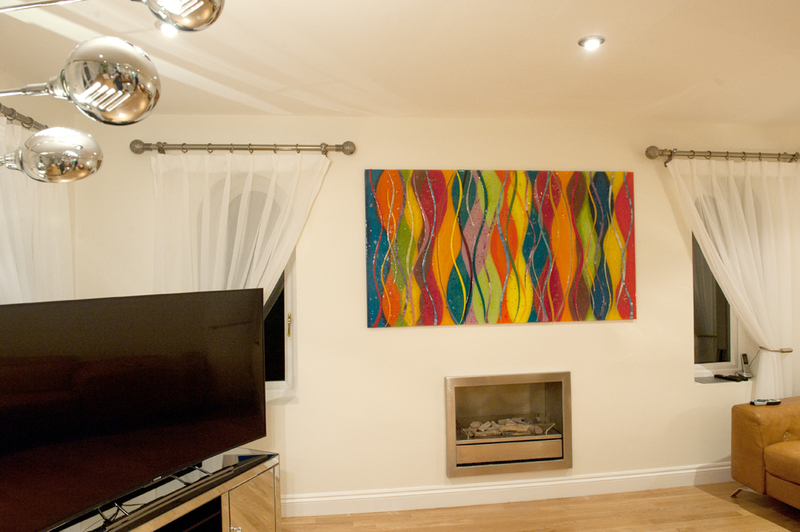 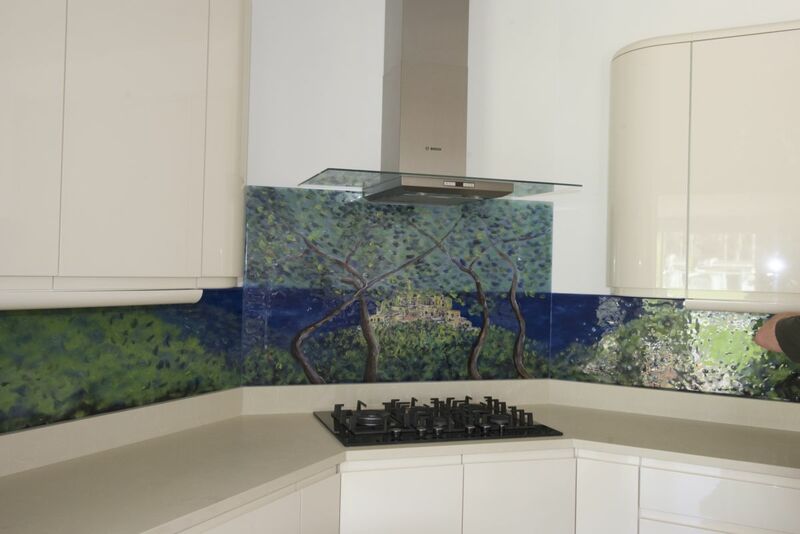 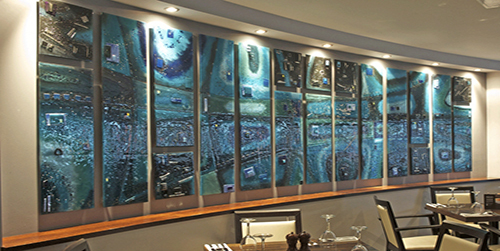 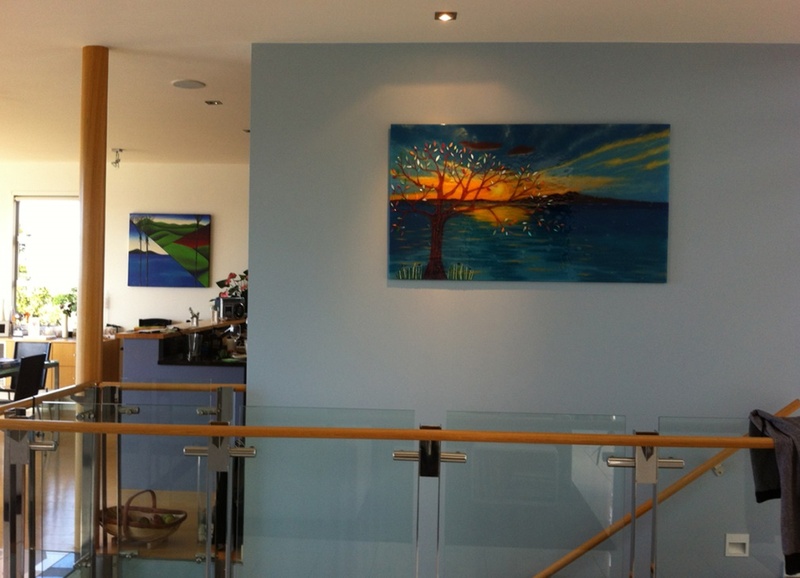 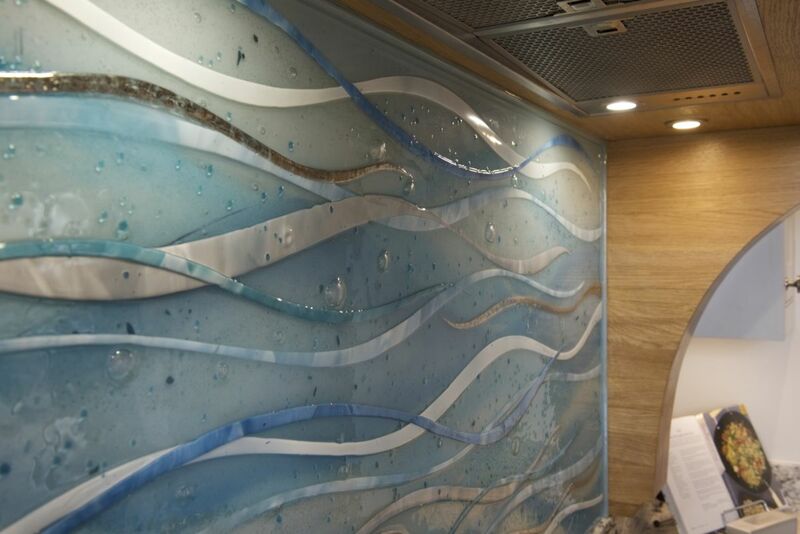 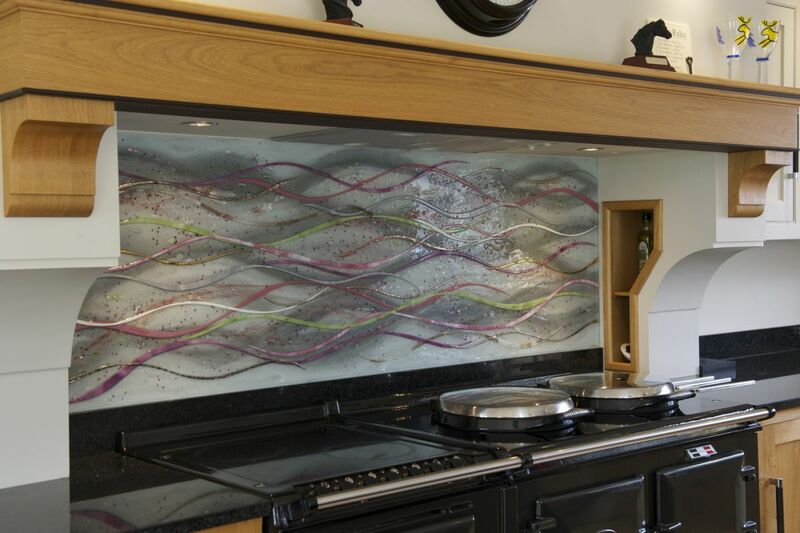 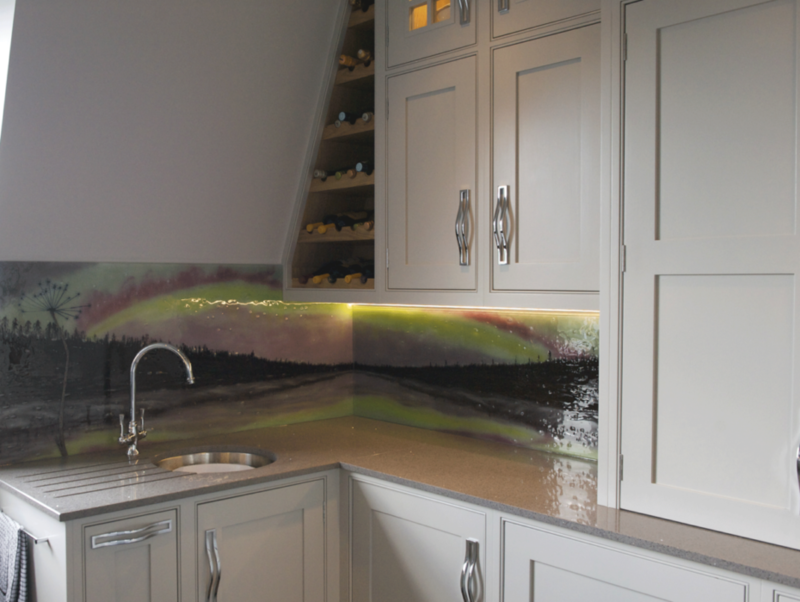 Whether you’re looking for bespoke glass splashbacks like the piece you see above, something for the wall or even a glass accessory or two, there’s simply nowhere better to go for the finest fused glass products. 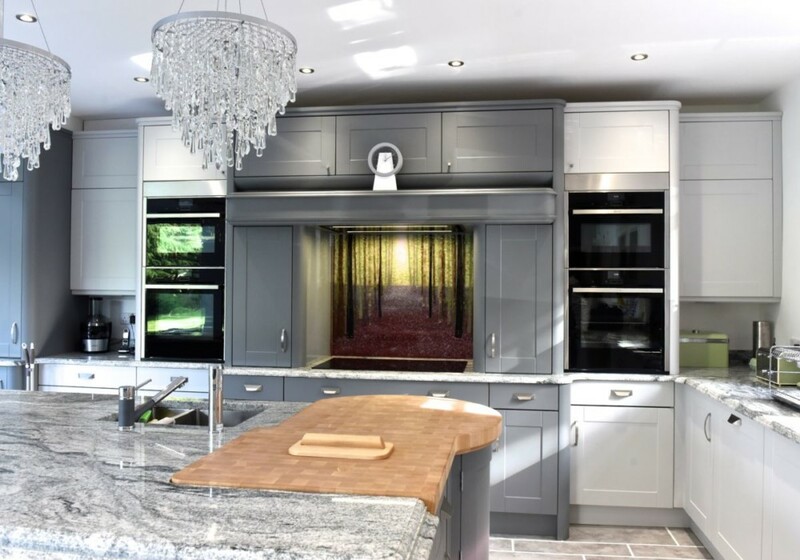 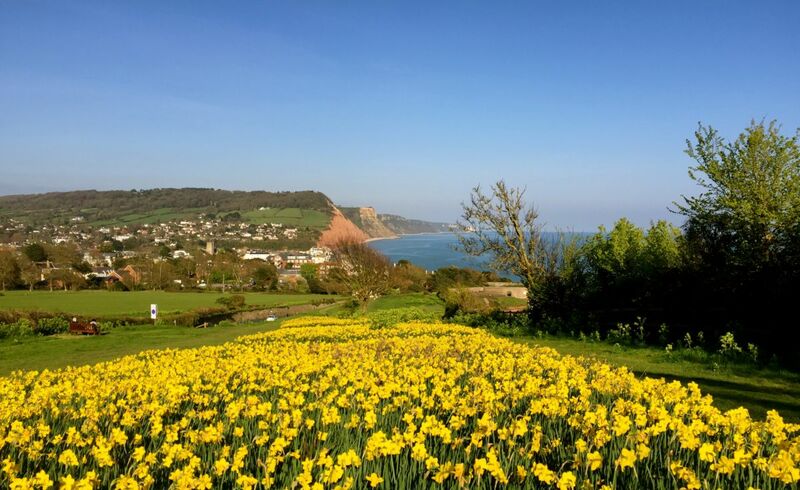 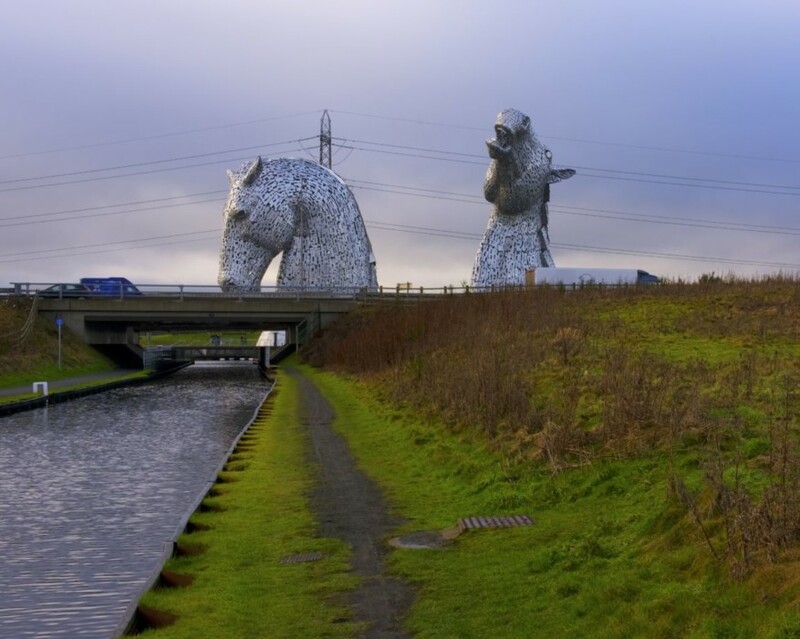 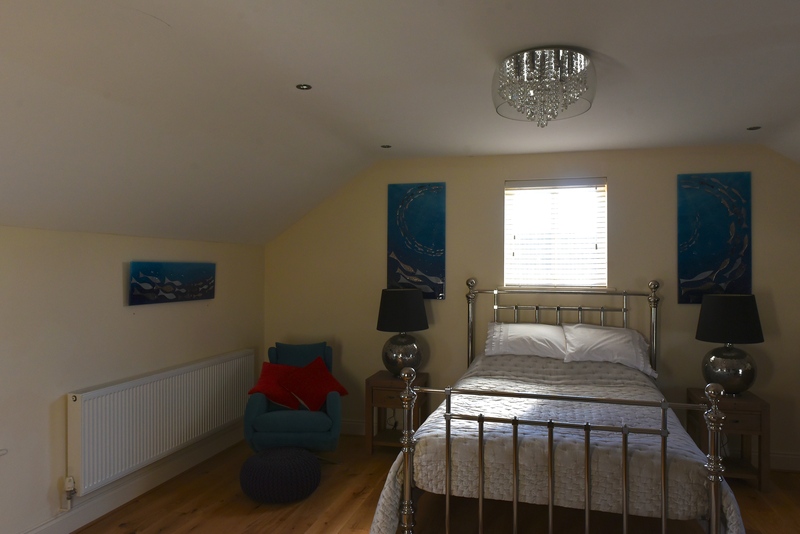 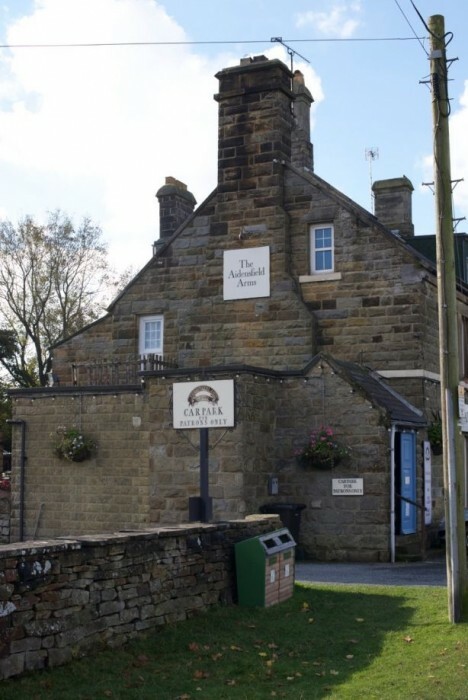 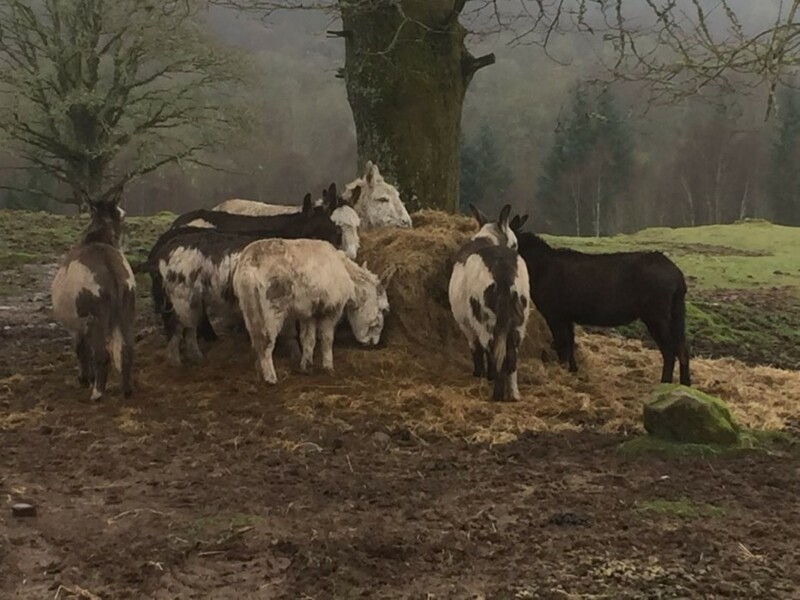 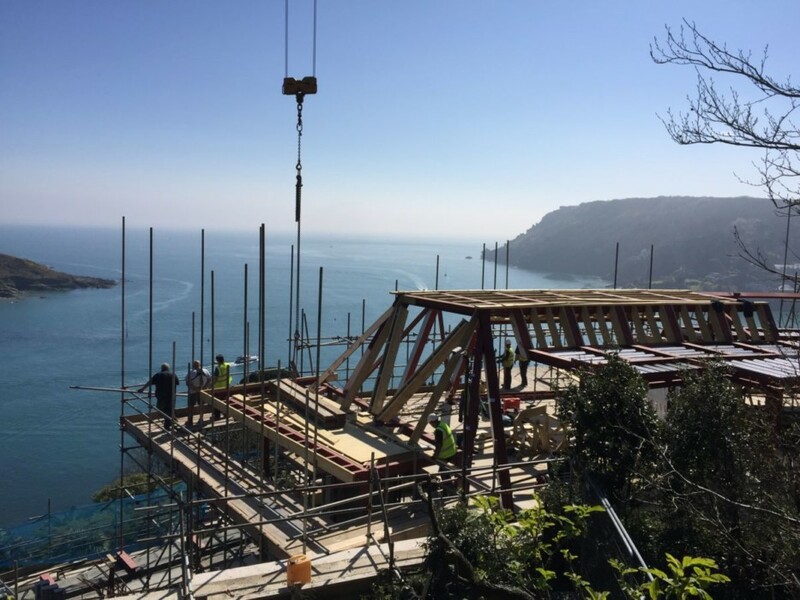 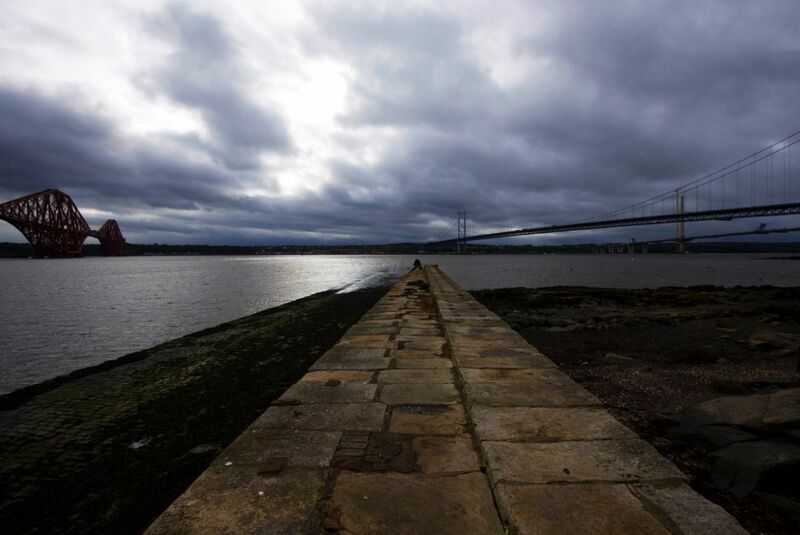 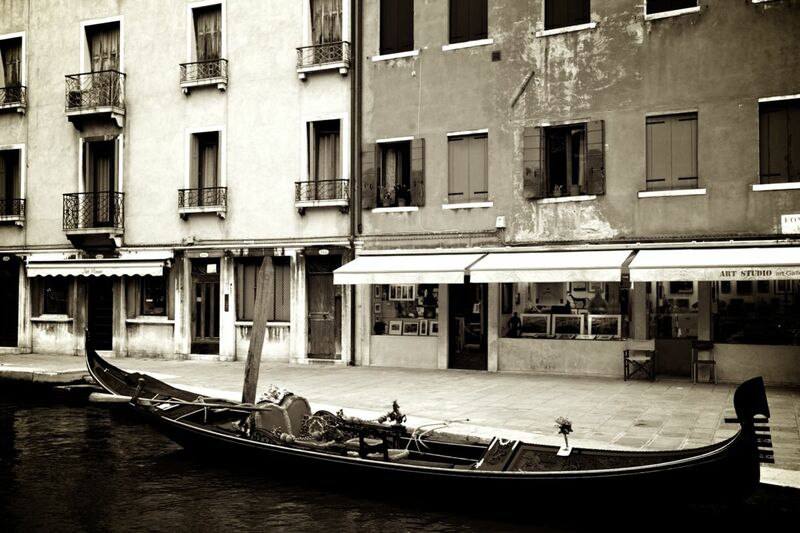 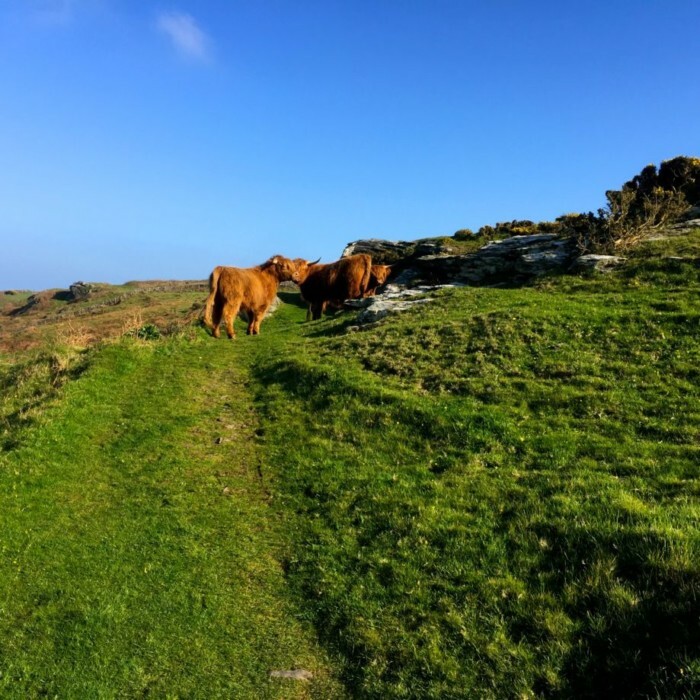 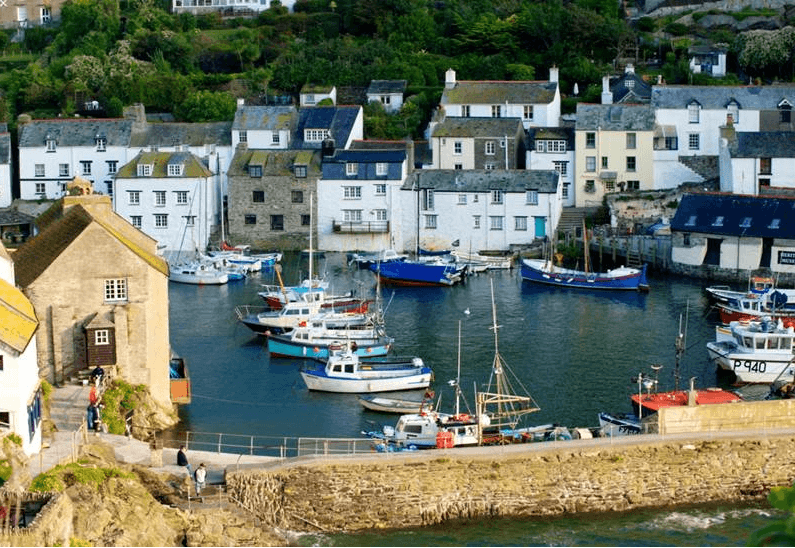 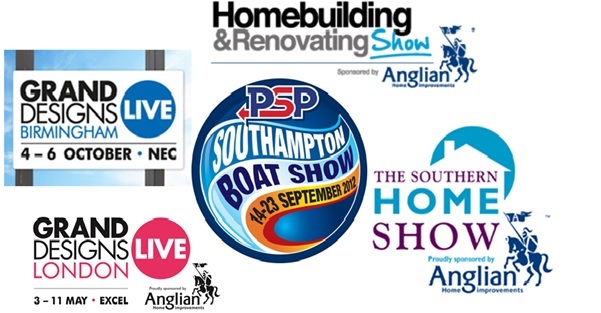 You can find our full contact details right here on our website, so don’t hesitate to get in touch either by phone or email.